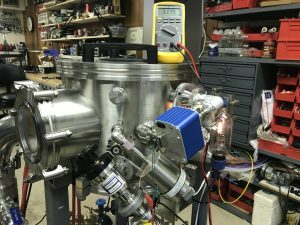 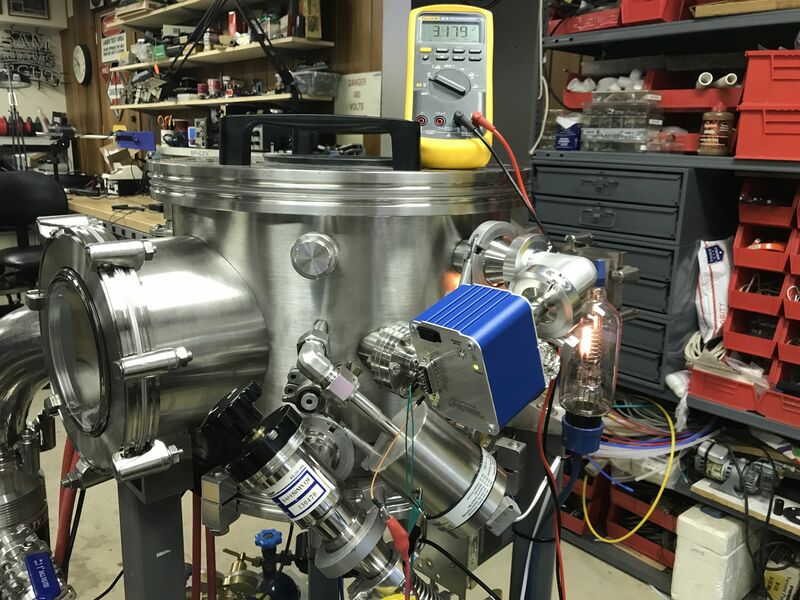 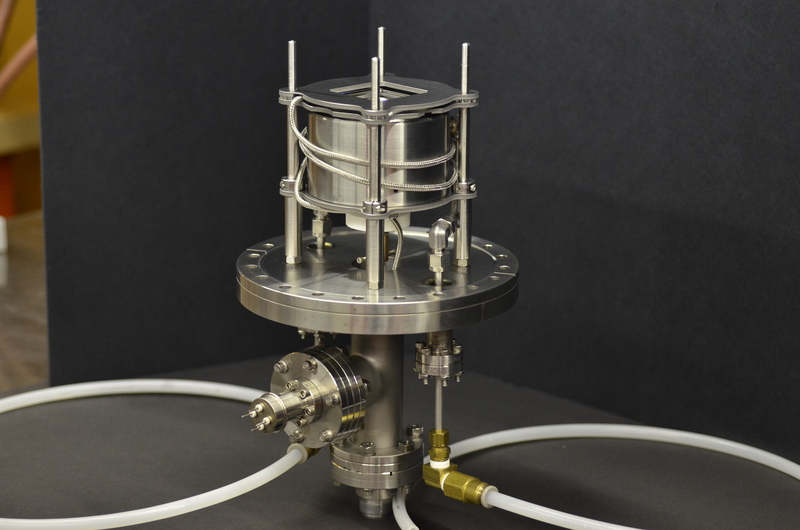 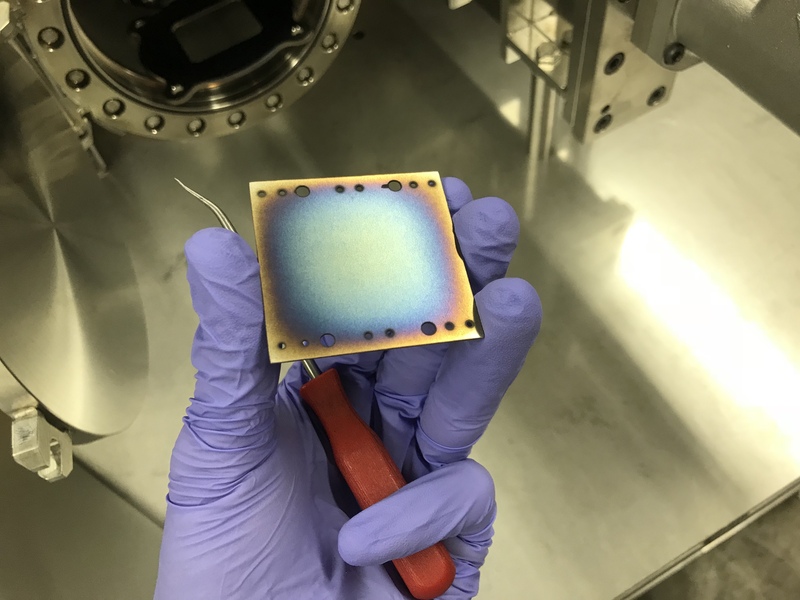 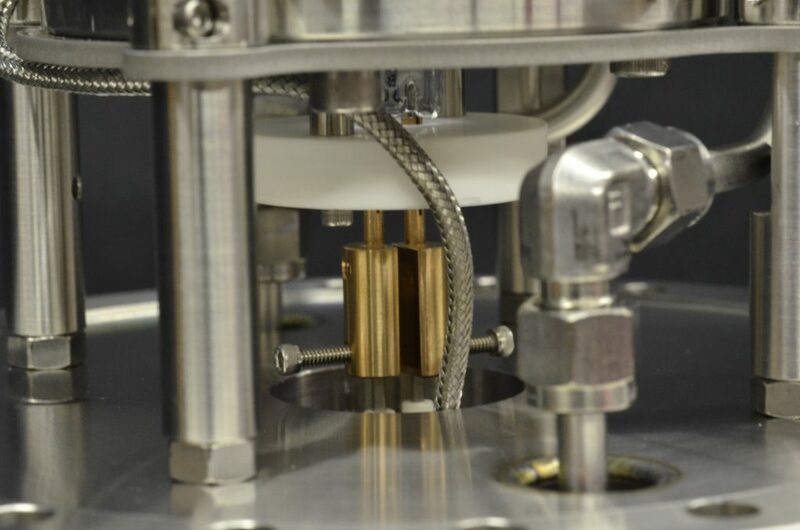 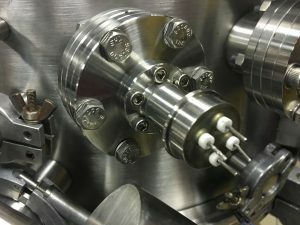 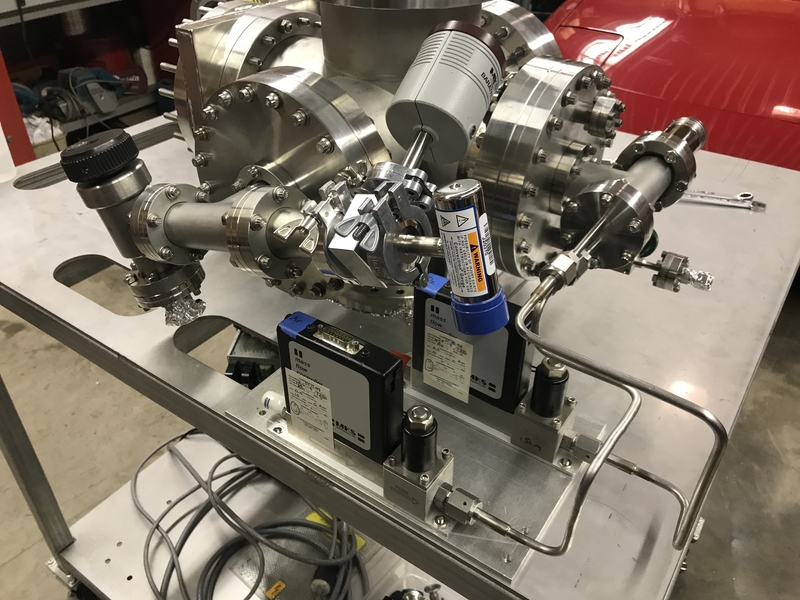 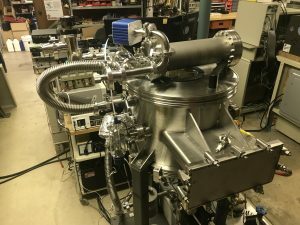 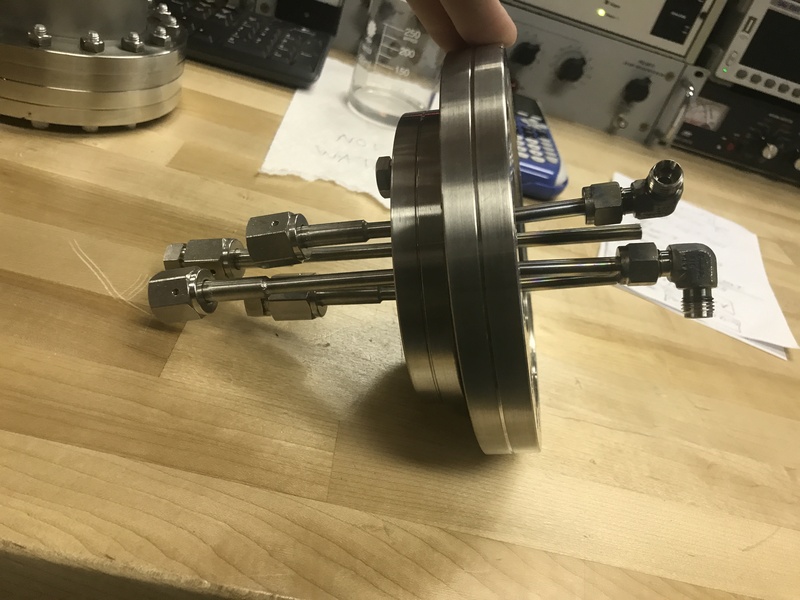 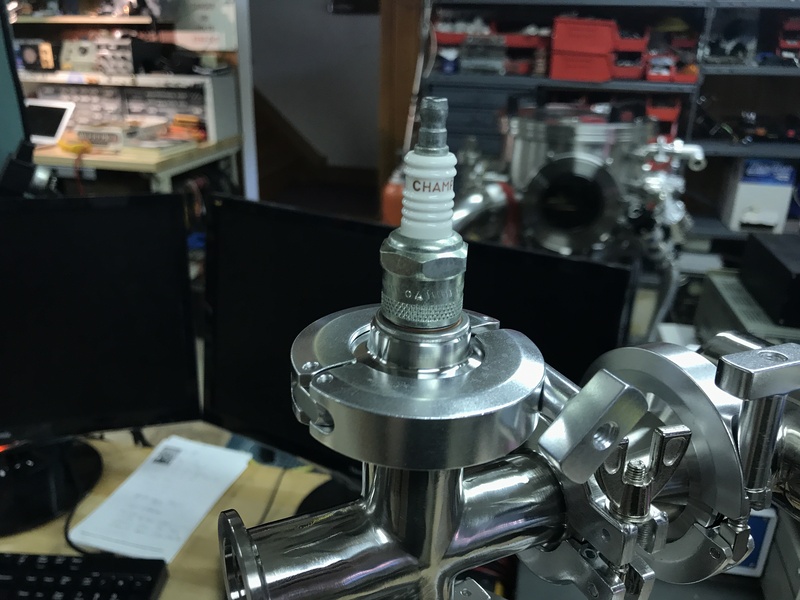 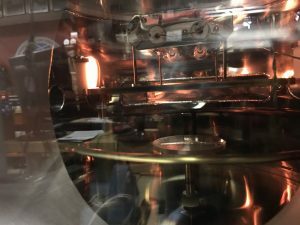 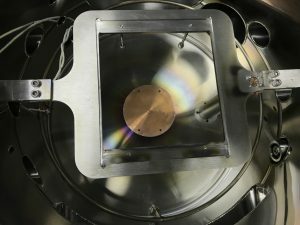 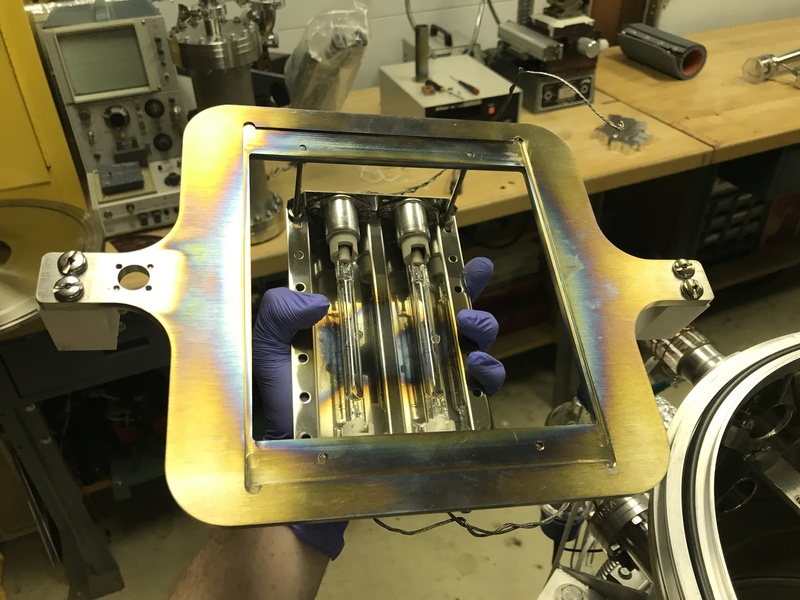 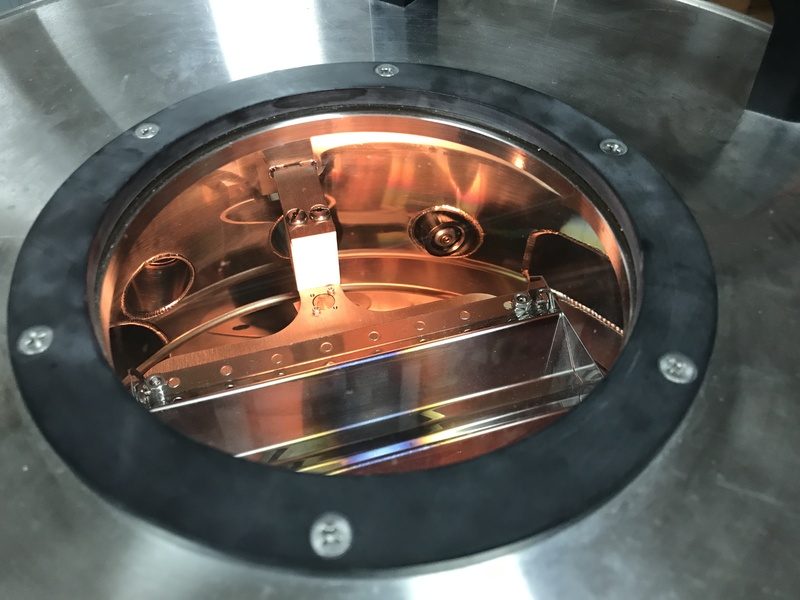 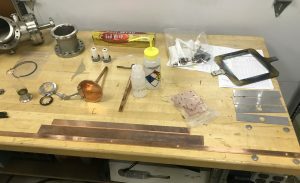 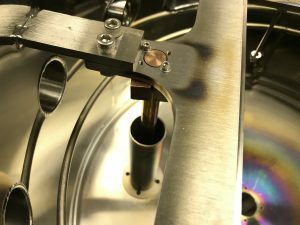 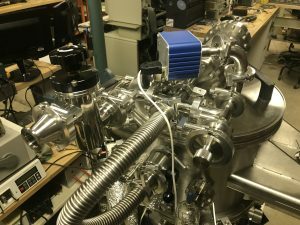 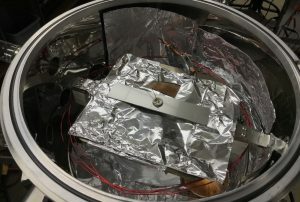 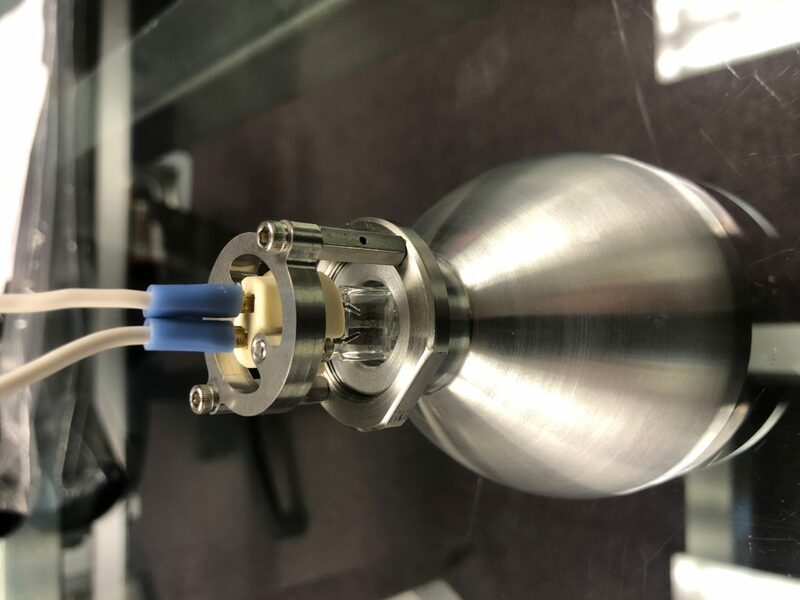 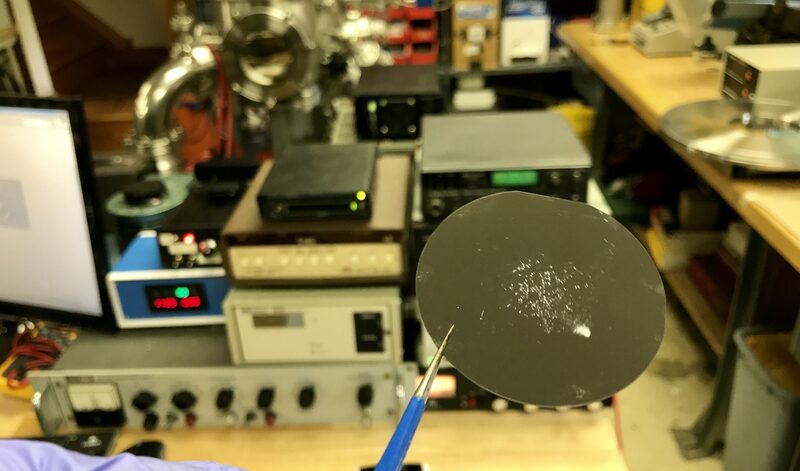 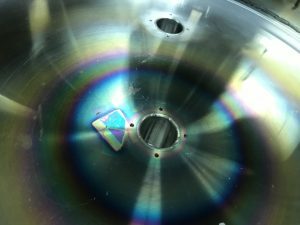 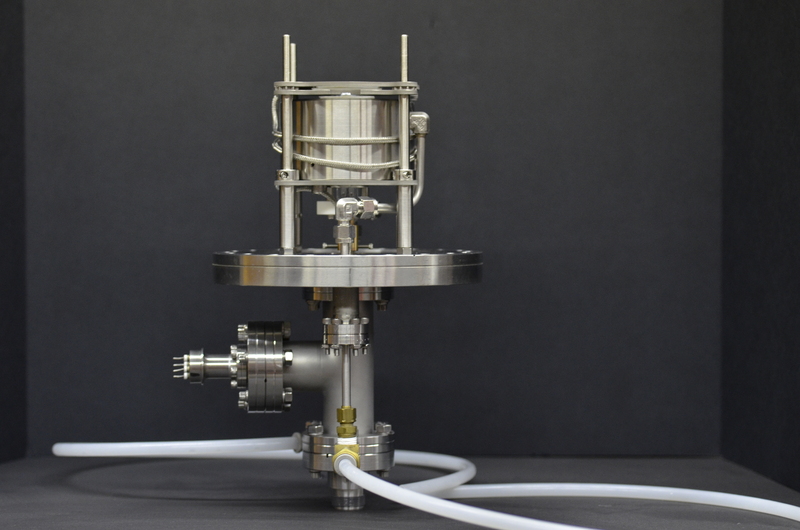 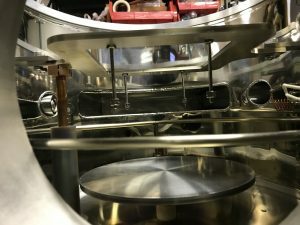 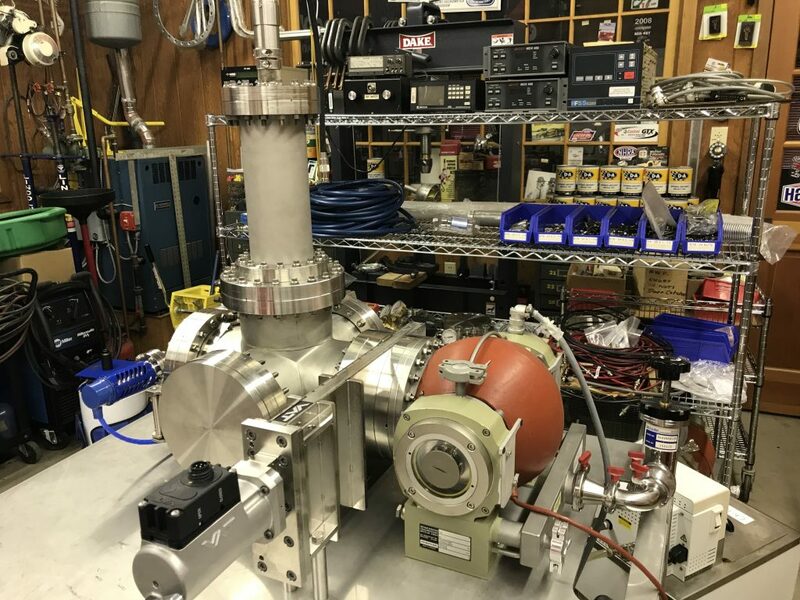 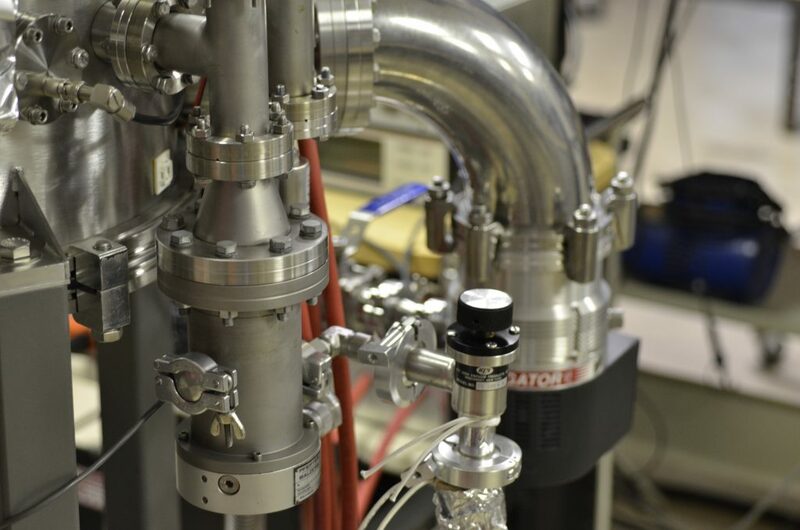 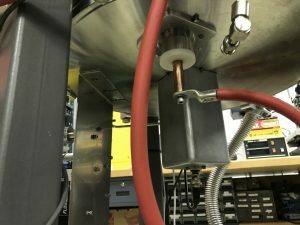 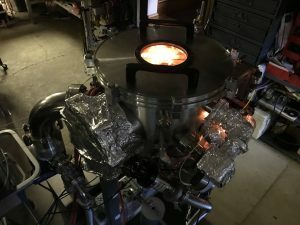 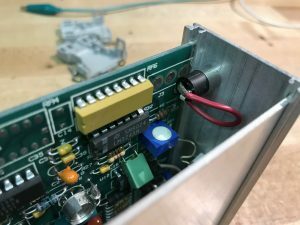 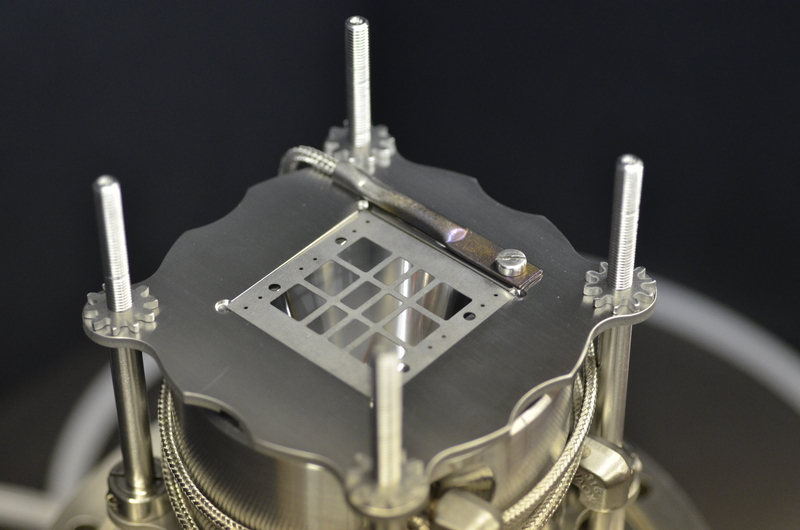 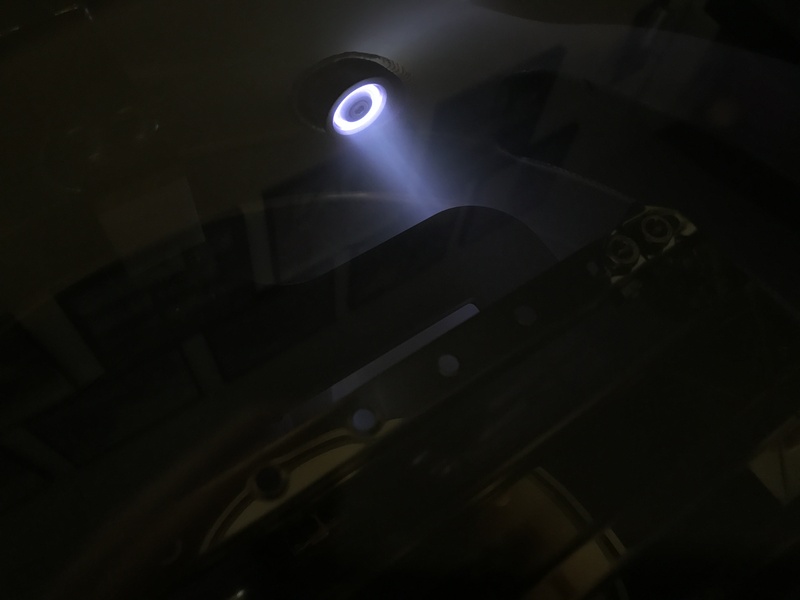 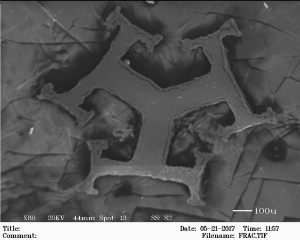 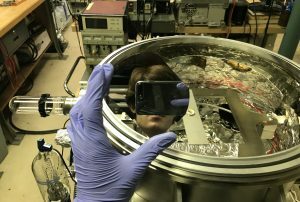 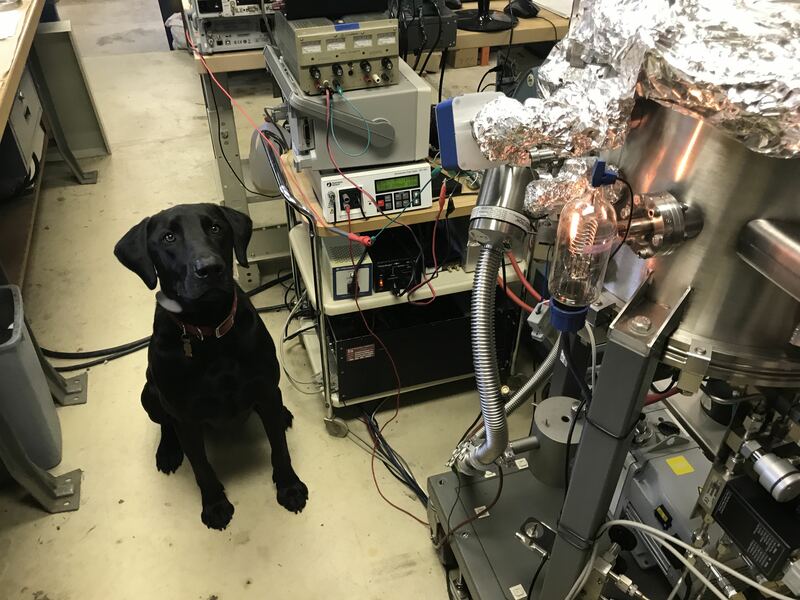 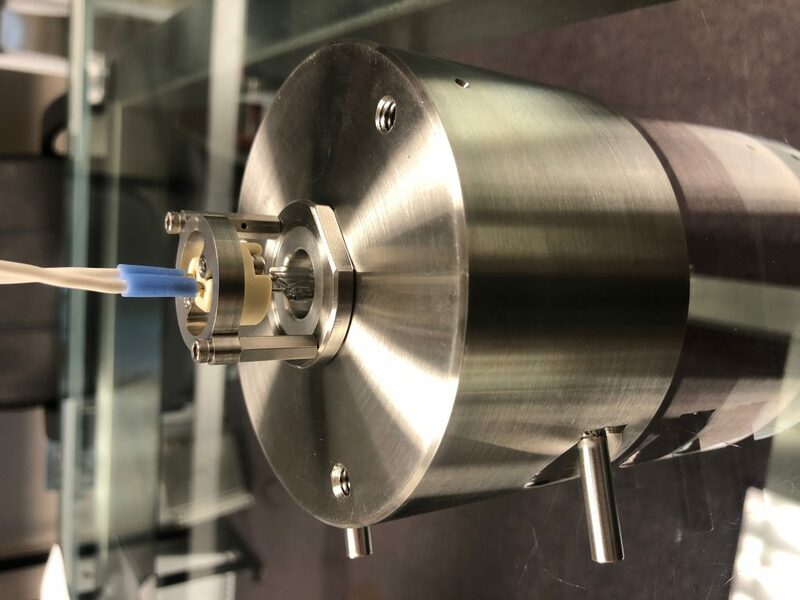 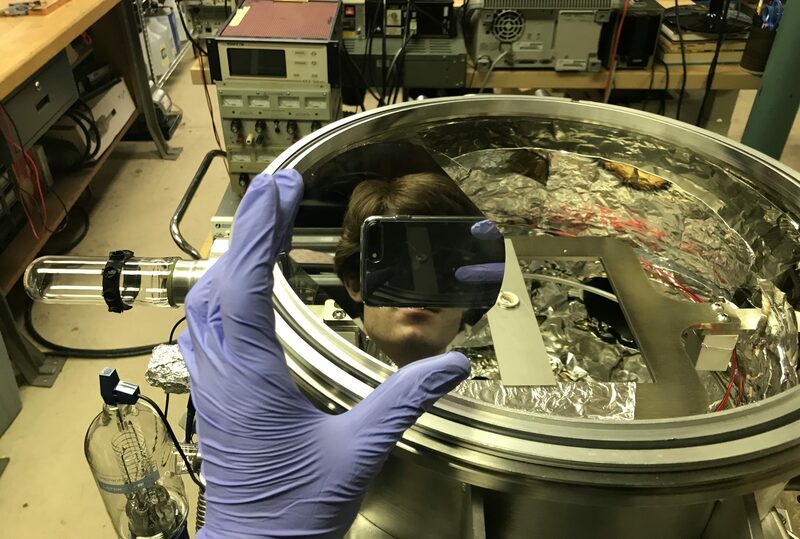 This project involved developing a sputtering system in collaboration with Ilya Drozdov in the Oxide Molecular Beam Epitaxy / Condensed Matter Physics Group at the Brookhaven National Laboratory. 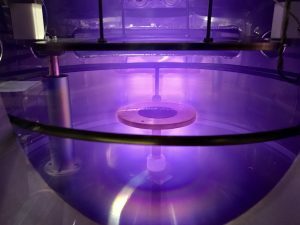 This system has 2 process gas feeds, an infrared substrate heater, and is designed for low-rate coatings that last 2 weeks each. 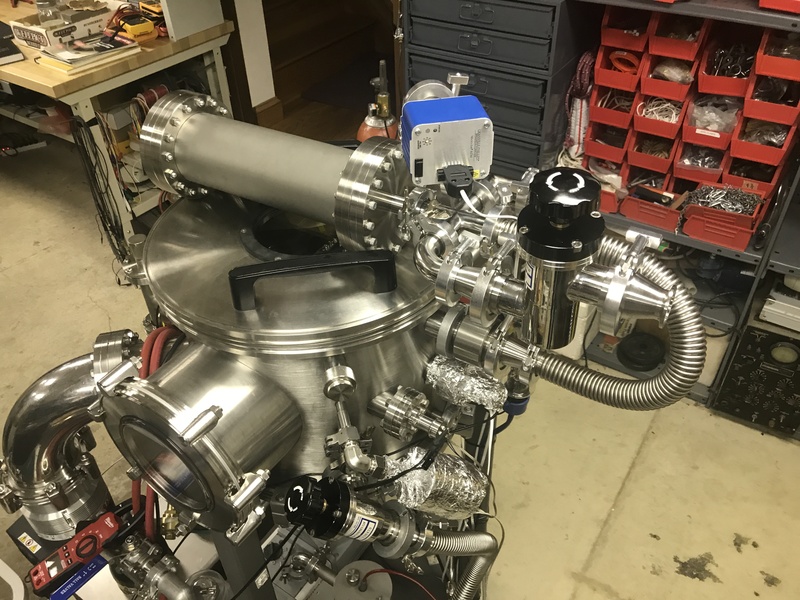 The vacuum system consists of a large dual turbo pump (510L/s) backed by a scroll pump and throttled with an 8″ VAT gate valve. 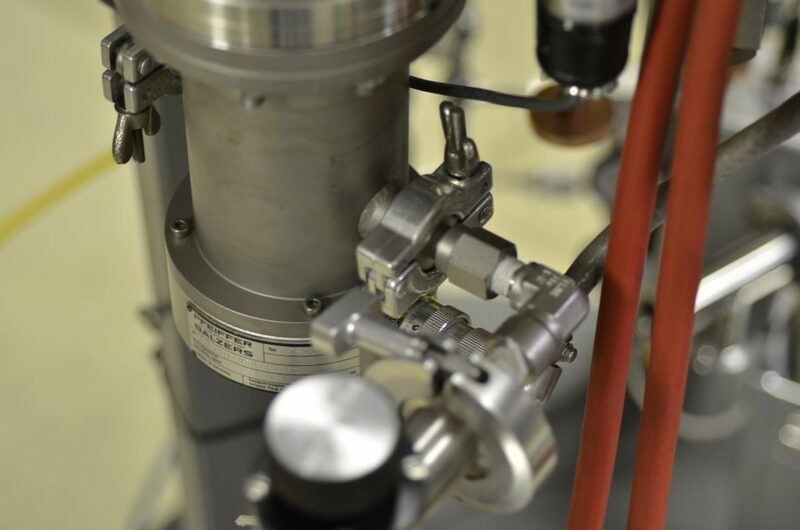 The process requires O2 and Ar lines on Mass Flow Controllers plumbed in as well. 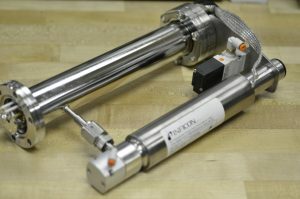 The MKS controller drives the MFCs to flow in the process gasses in the correct ratios and keep the pressure within 1% of the setpoint. 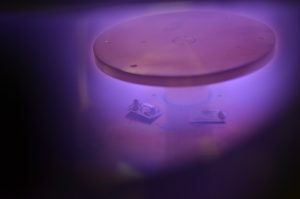 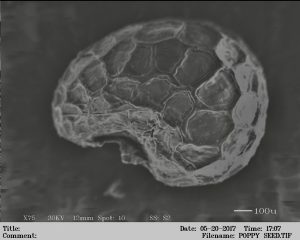 The chamber is quickly evacuated to the 1e-7 Torr range although the actual process occurs around 50 – 100mTorr under O2/Ar atmosphere. 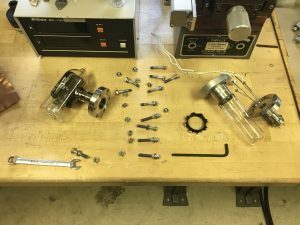 The 3″ dia. 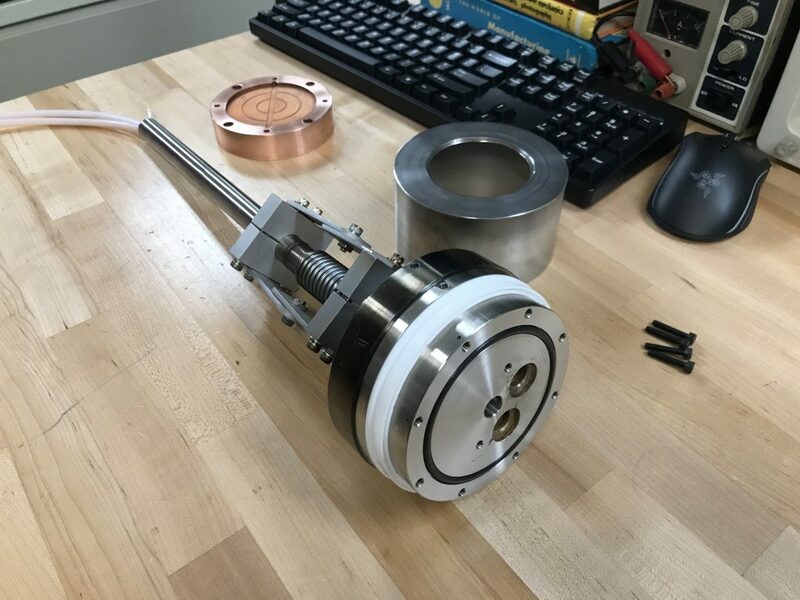 sputter gun was salvaged from combining old stock of broken ones together and making one functioning sputter gun. The sputter target is clamped to the Copper puck which is water cooled because of the high power involved in these sputtering processes. 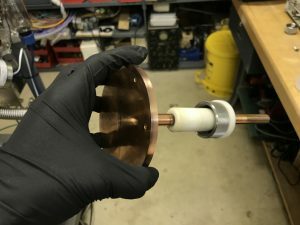 All of the sputter gun parts I started with had rusted magnet assemblies, so I had to make a new one. 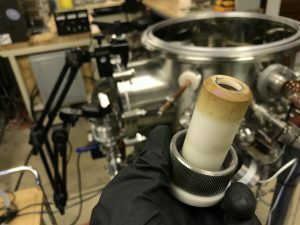 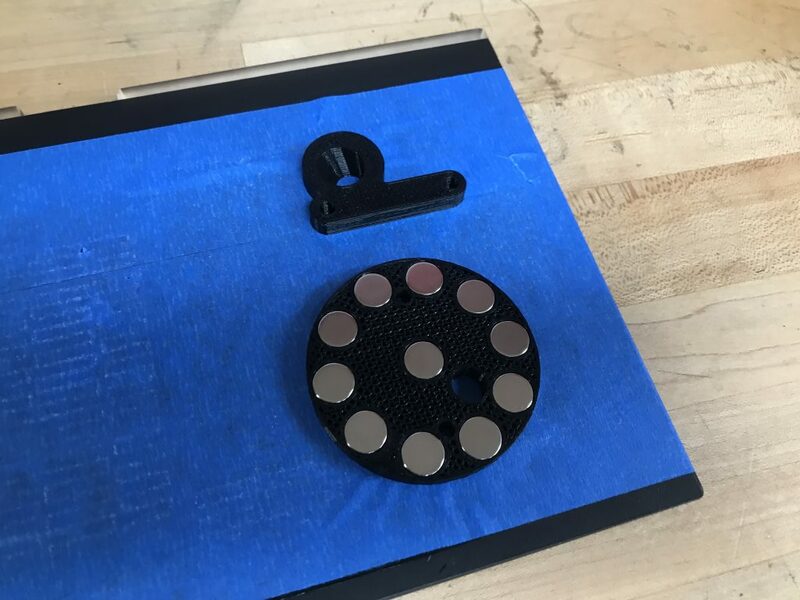 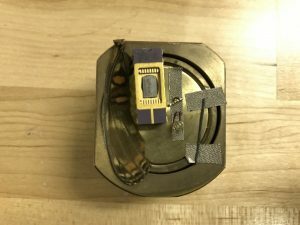 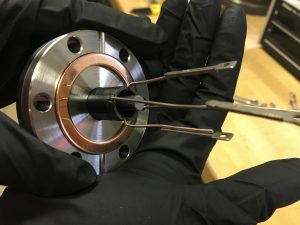 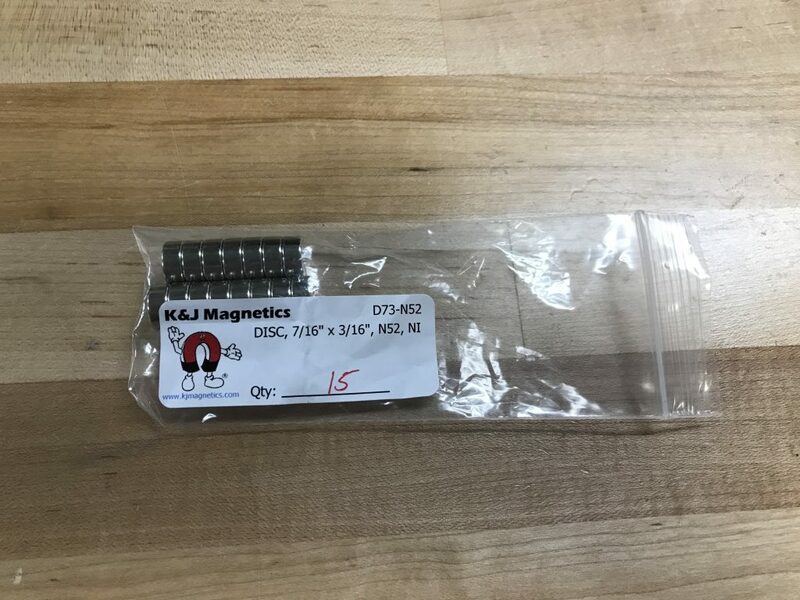 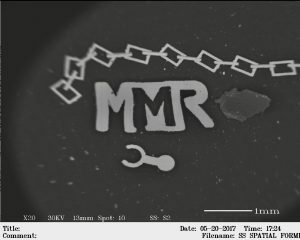 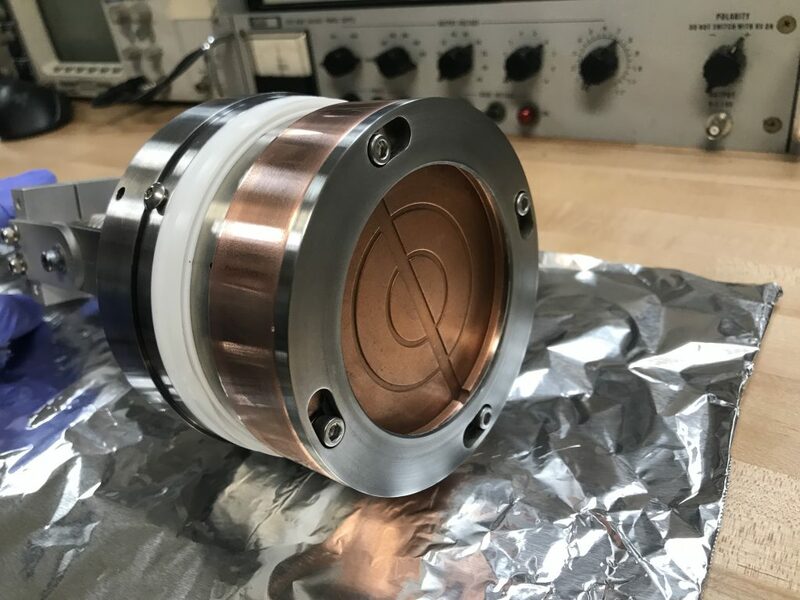 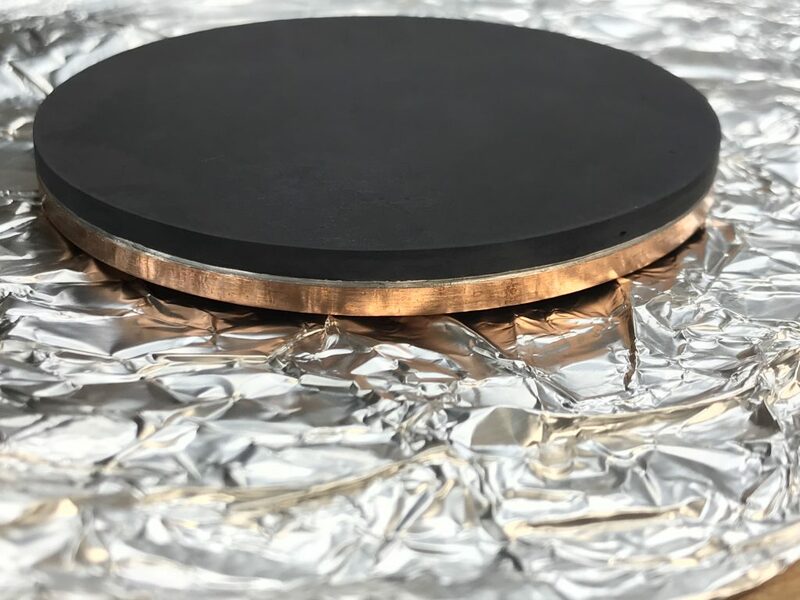 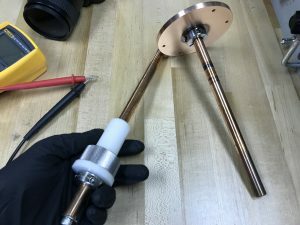 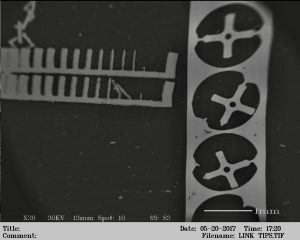 A 3D printed puck that fits inside the copper piece was designed with embedded rare Earth magnets to create a surface DC field of around 400 Gauss which confines electron movement and induces the magnetron effect. 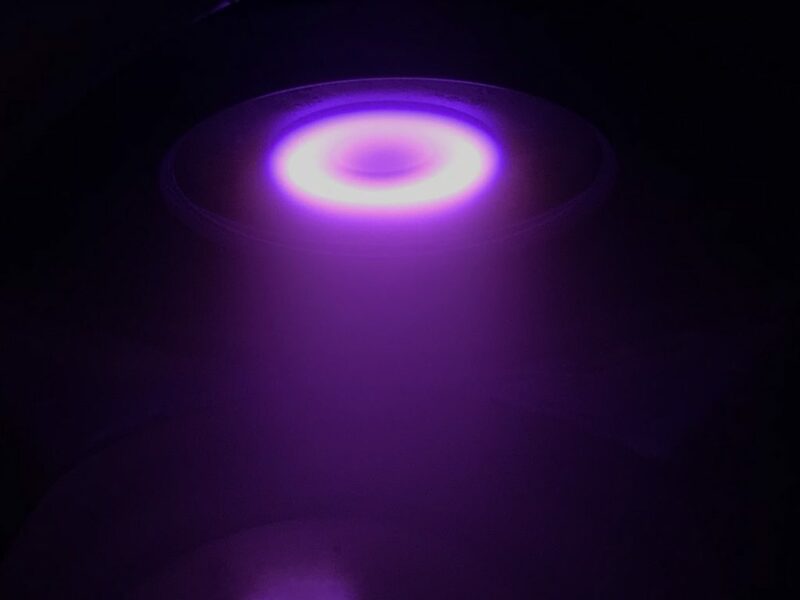 The “racetrack” ring-like plasma density in front of the target indicates the circular path of the electrons due to the Lorentz force, meaning that the magnet assembly has sufficient strength at the surface of the target. 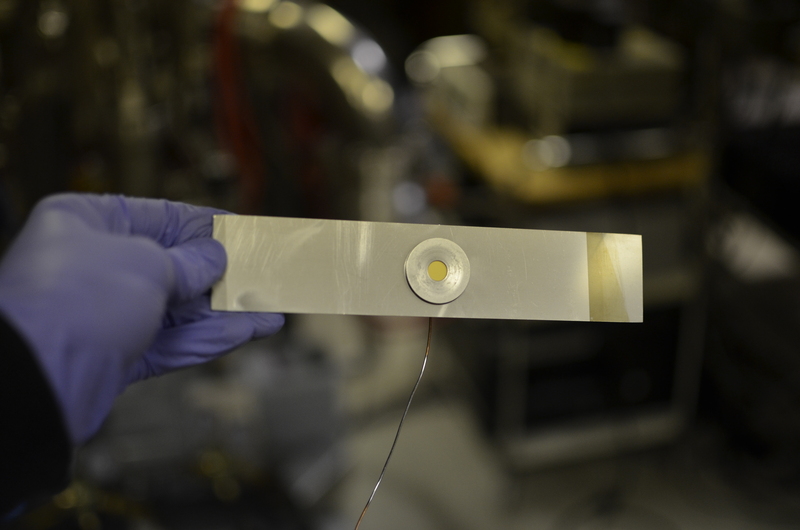 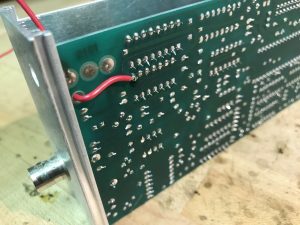 The final part of the project was the substrate heater which heats the sample from the back while it is being coated from the front. 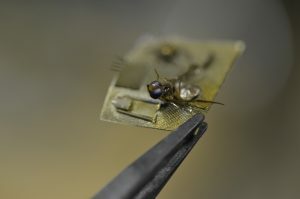 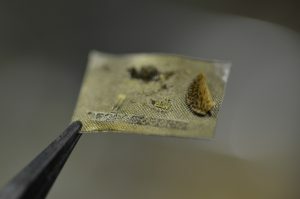 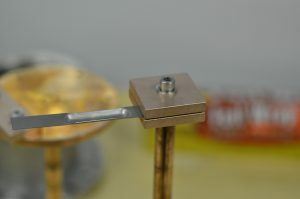 The specific process required that the substrate to be at elevated temperature (up to 850C) for 2 weeks. 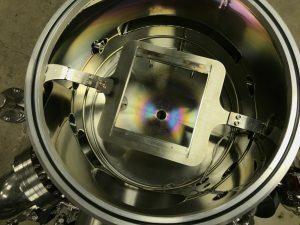 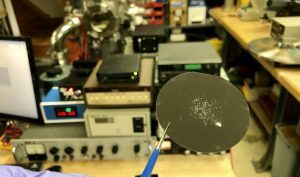 An infrared substrate heater was designed using 300W USHIO quartz lamps and a water cooled Aluminum parabolic reflector to focus the light onto the substrate. 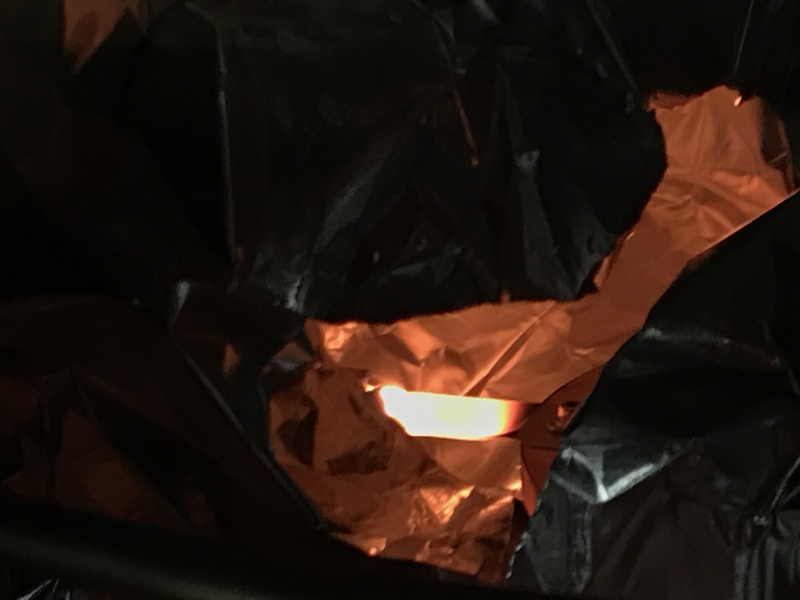 All parts of the heater which are exposed to elevated temperature are made from Inconel to avoid contamination of the delicate experiments. 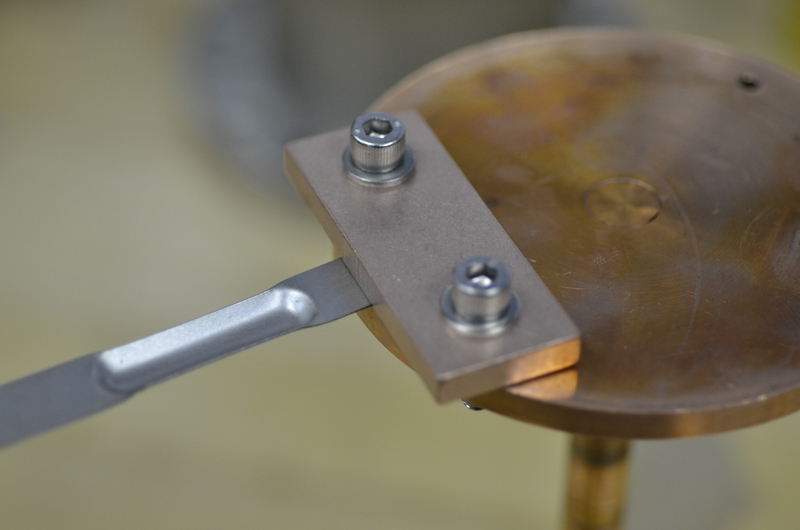 This includes the thermocouple, which is sheathed in Inconel and the wires are braided in Inconel as well. 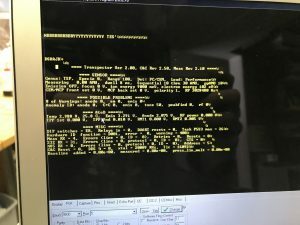 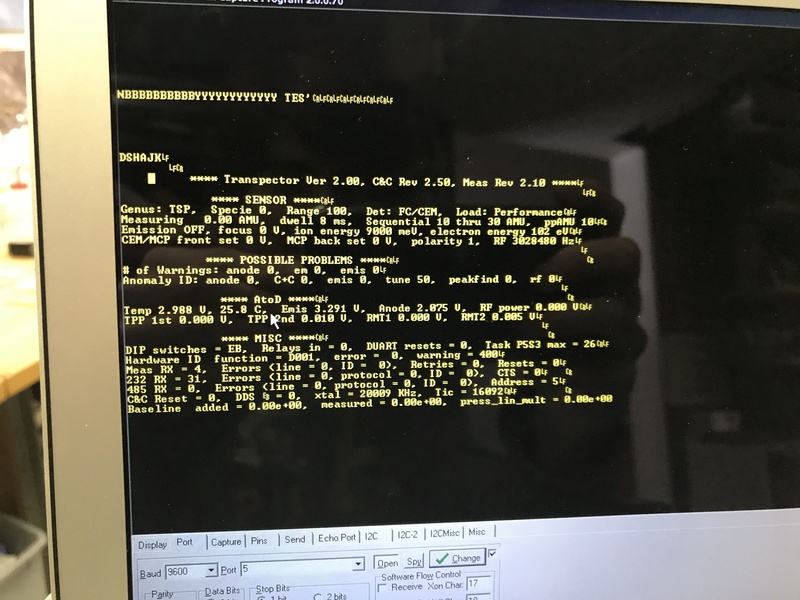 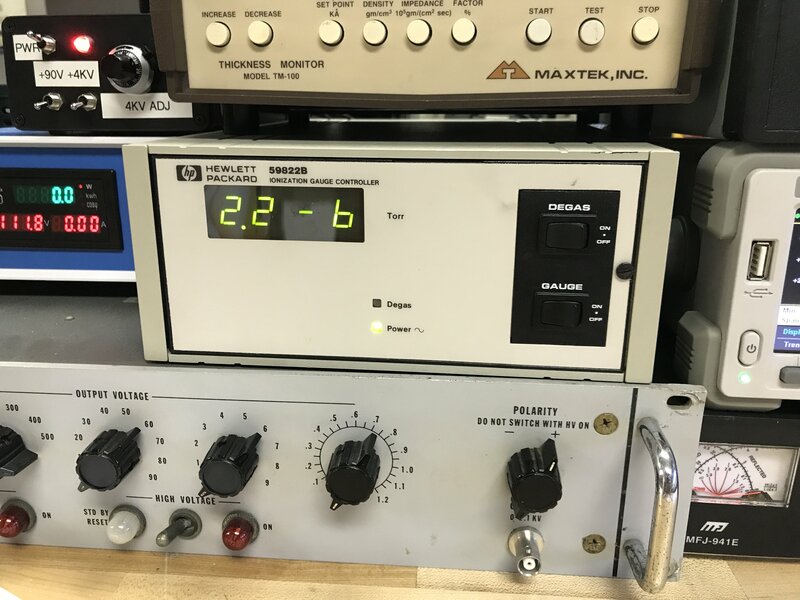 An Inficon Transpector2 HPR RGA was purchased from eBay and refurbished. 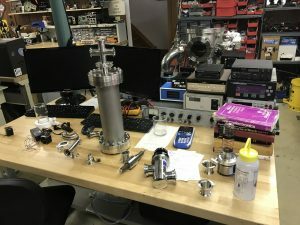 I will use it for leak checking and ion selection experiments. 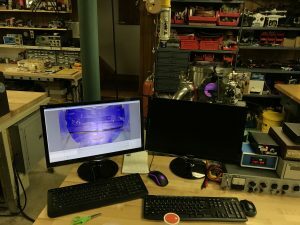 Thanks to Aota Vac and Inficon for software assistance! 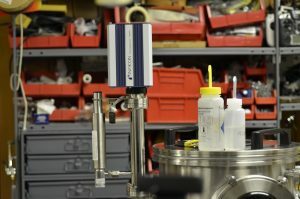 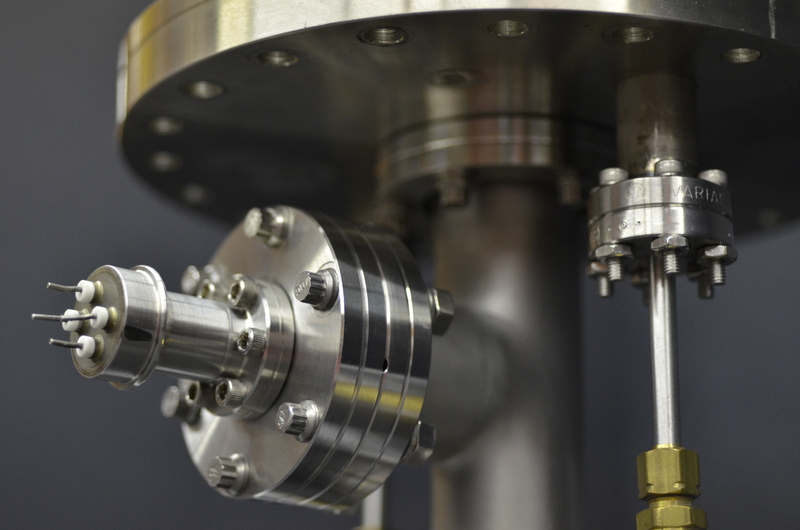 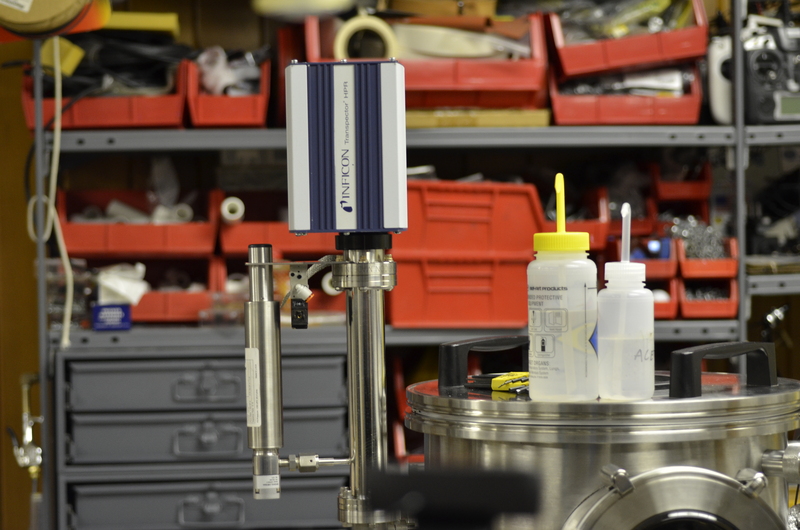 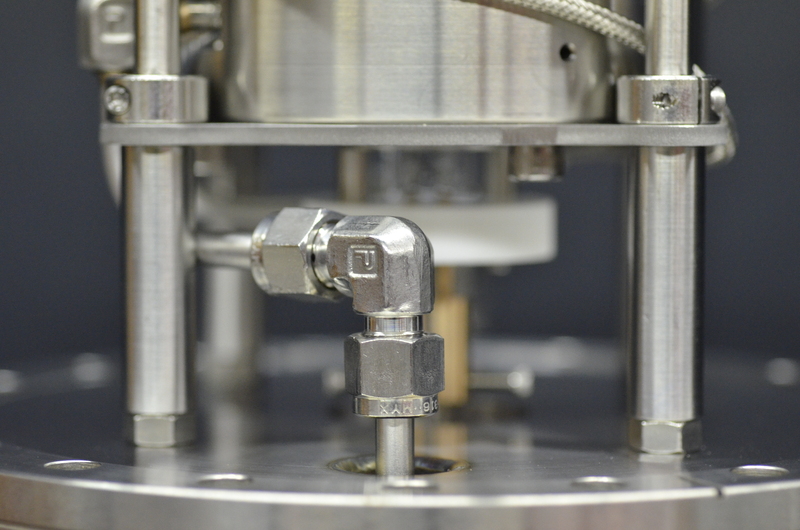 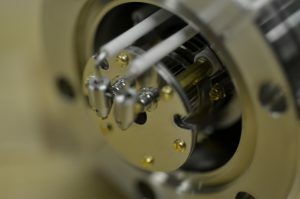 Put simply, an RGA is a small mass spectrometer that allows the operator to see the composition of the residual gases left in the vacuum chamber after pumping. 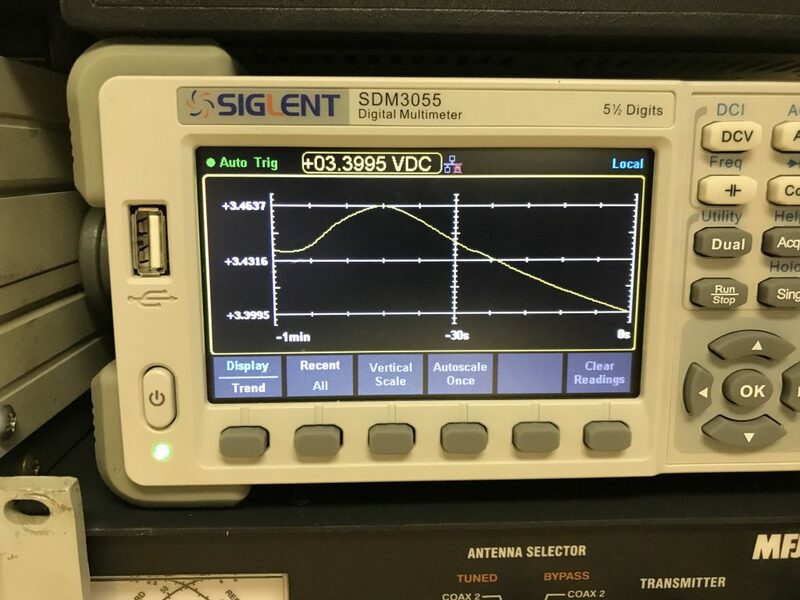 Basic theory here. 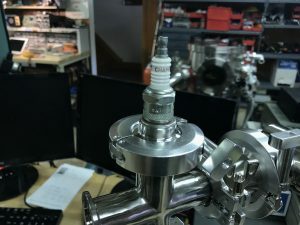 This RGA is equipped with an electron multiplier so it operates at a maximum pressure of 1e-4Torr and is good down to about 1e-15Torr which is not a limit I will be reaching anytime soon. 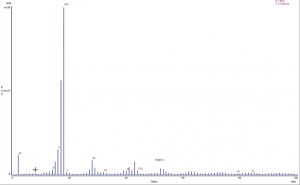 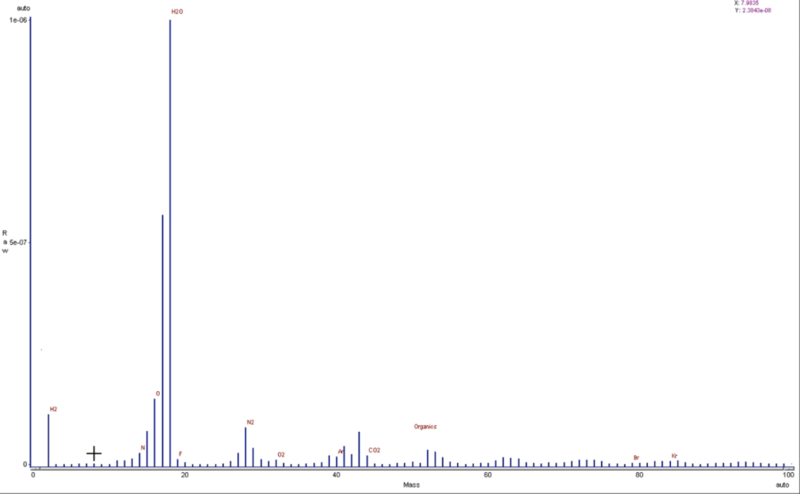 The spectra shown above indicates a large peak at an AMU of 18 which is H2O. 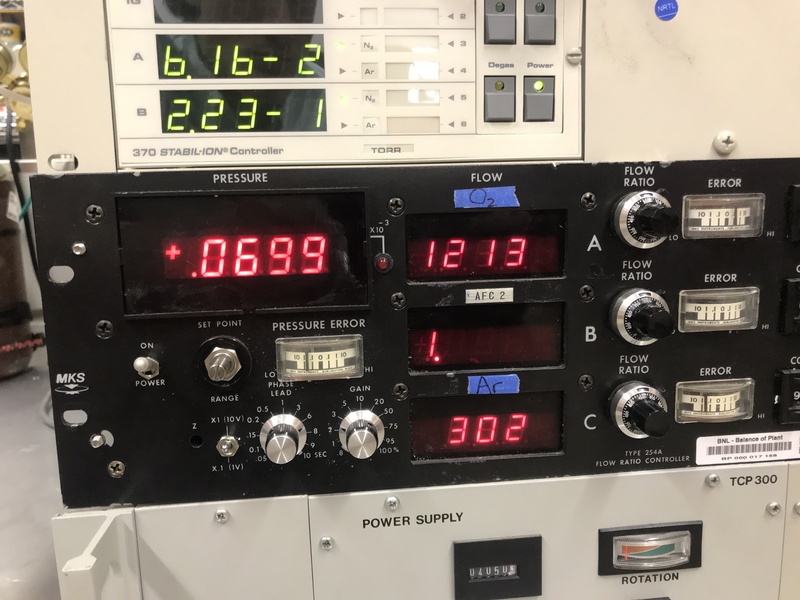 This means that the chamber needs to be baked out to remove water embedded in chamber walls and surfaces until the highest peaks are N2 and O2. 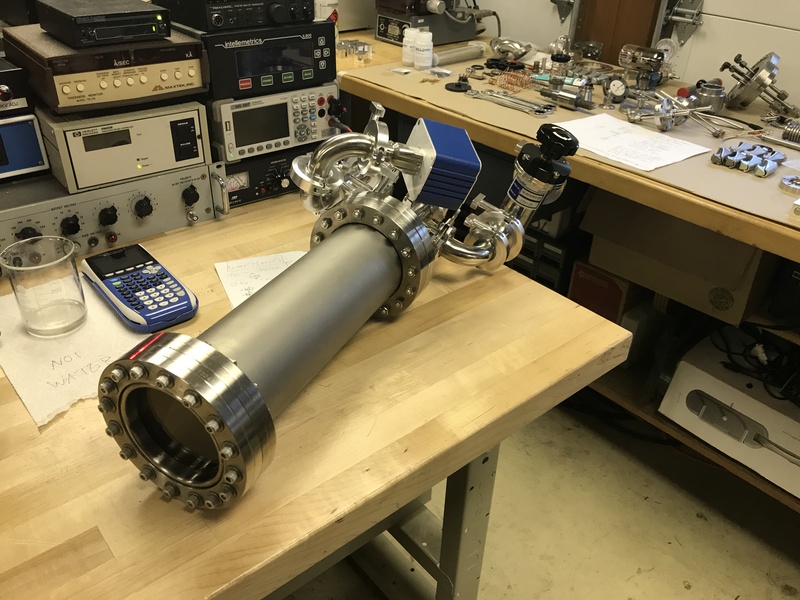 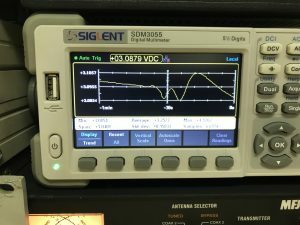 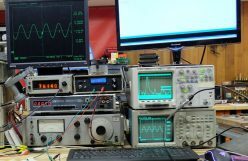 A spectrum analyzer and near field probe was used to determine the main operating frequency of the RGA to approximately 3.02mhz. 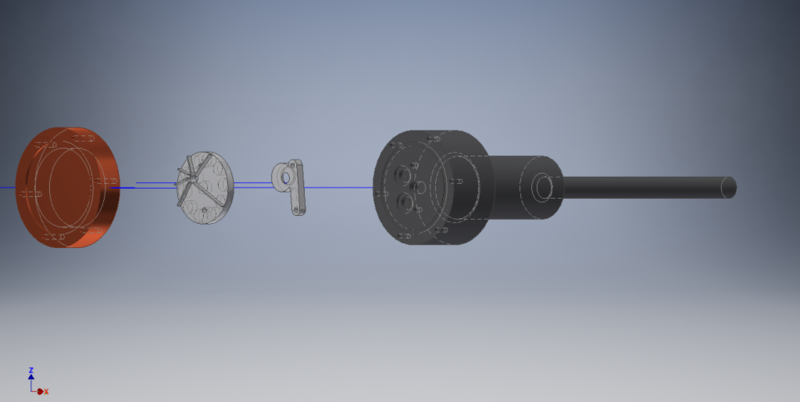 The RGA is also equipped with an Ar calibration source. 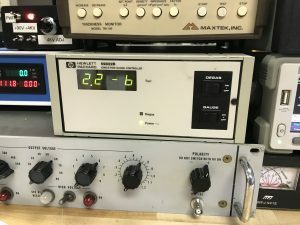 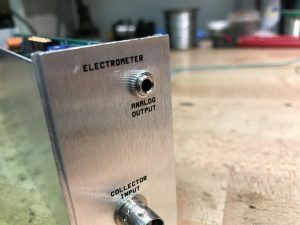 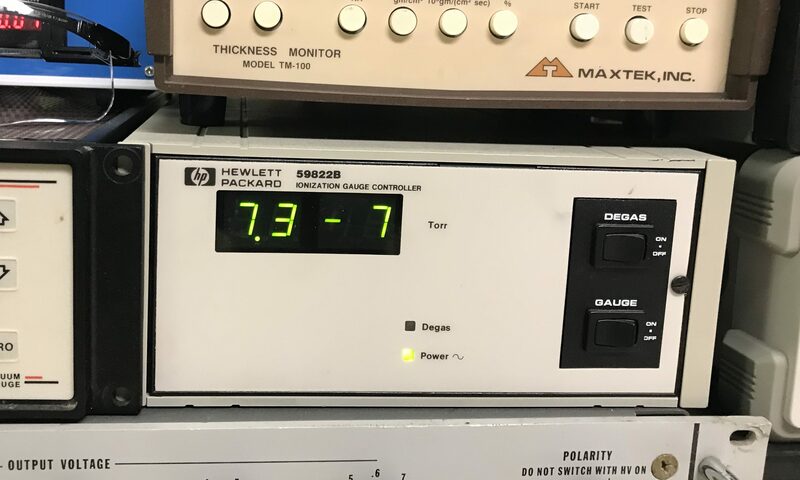 Serial logs indicate that it was manufactured in 2007 and has been run thousands of hours past recommended service/filament replacement and the measured total pressure in the chamber was over an order of magnitude too high when compared to a hot-cathode ion gauge, but after calibration everything seems to be in spec. 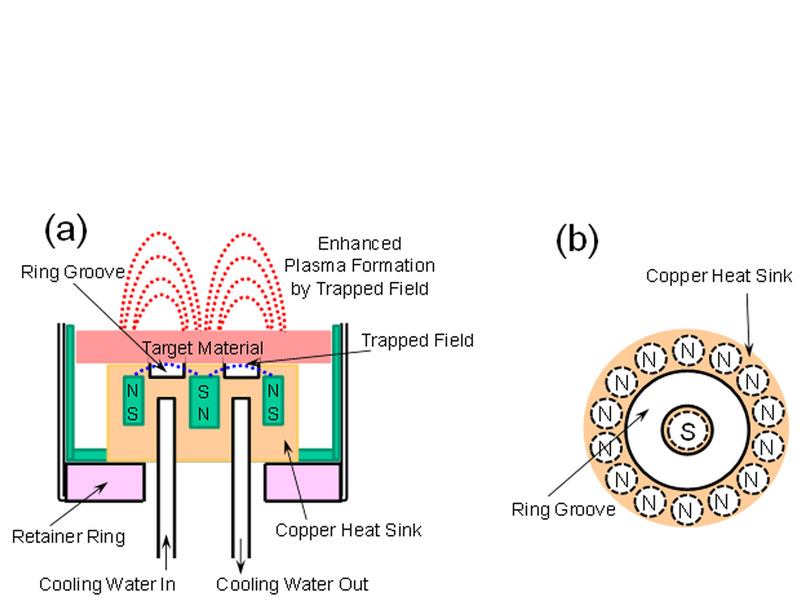 Thermal evaporation deposition of Al and Ge from Tungsten and Tantalum boats, respectively. 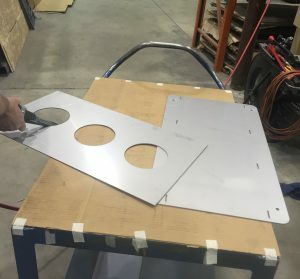 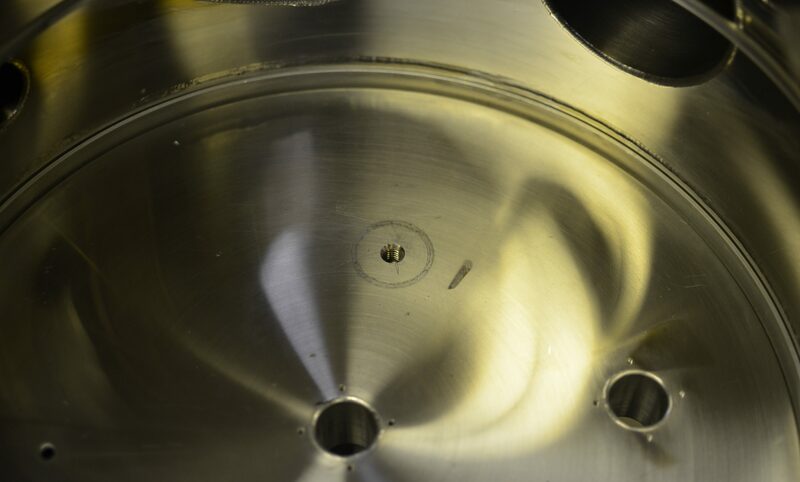 A blind hole is drilled and tapped in the chamber bottom plate for a center tap feedthrough (common ground) for the boats. 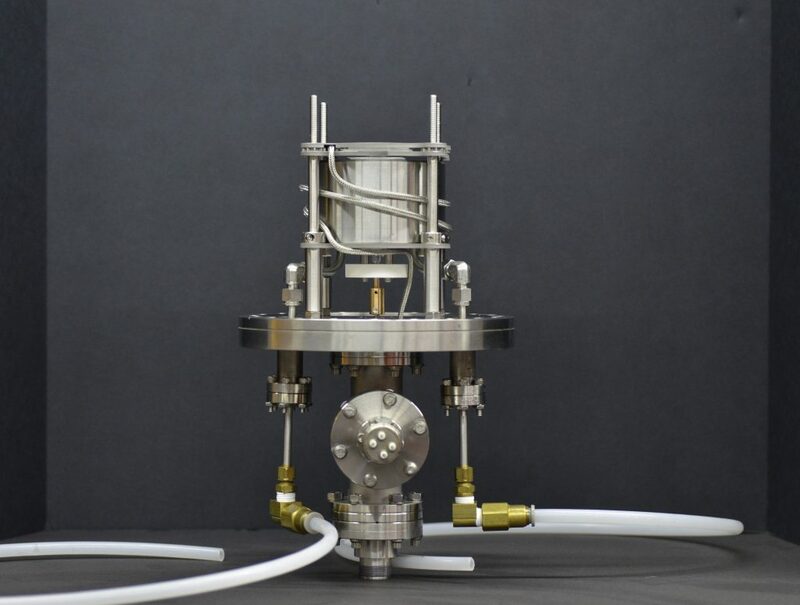 Deposition starts at around 7e-7Torr and ends around 5e-6Torr due to outgassing. 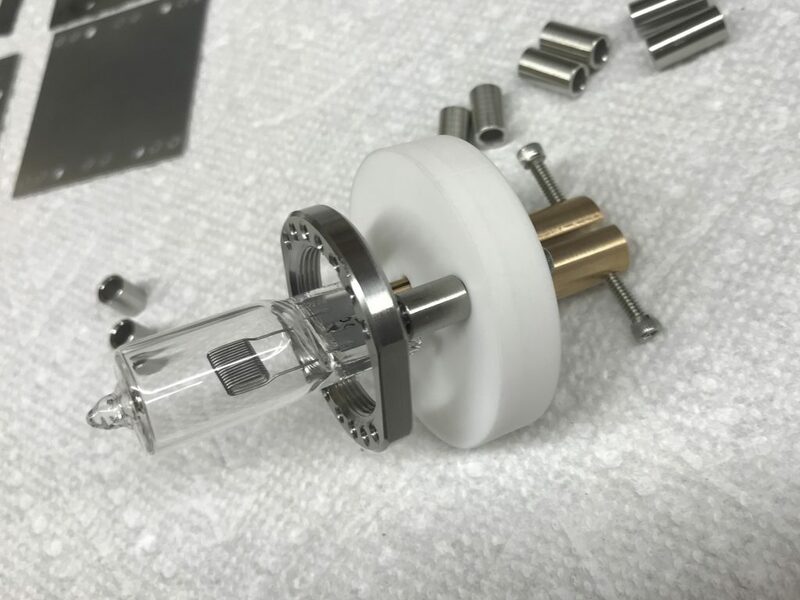 Aluminum alloys with Tungsten at the high temperature and causes boat failure, a thicker gauge boat will be used in the future or one made of TiB2-BN or BN. 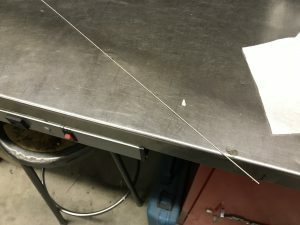 Update: W 0.015″ boat thickness seems OK.
Approx. deposition rate throughout the run was 2.2A/s, with total accumulation of 500A. 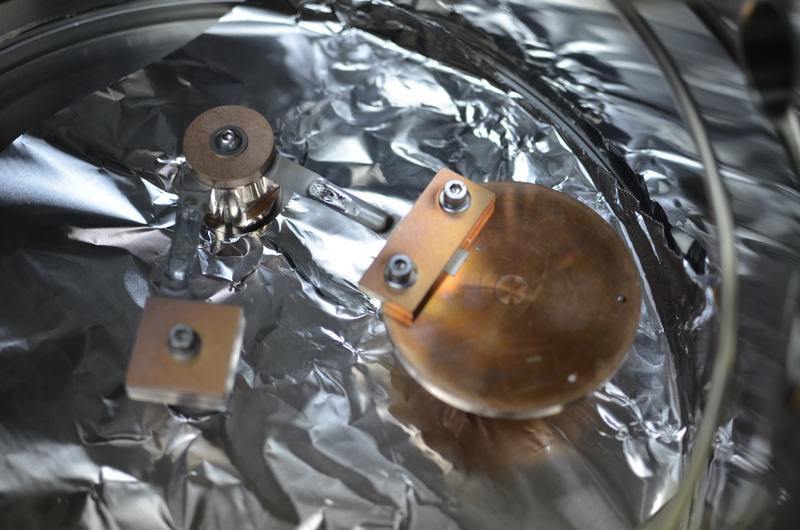 Much faster than my sputtering setup but yields a worse film. In situ plasma cleaning is via the red ICP coil seen in the 8th picture. 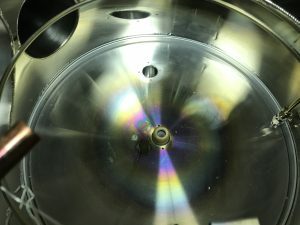 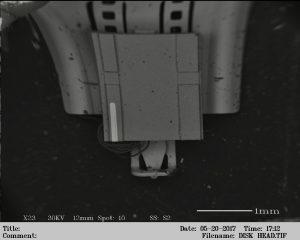 A Quartz Crystal Microbalance (QCM) is used to measure the thickness of the deposited films and current is supplied by a rewound microwave oven transformer. 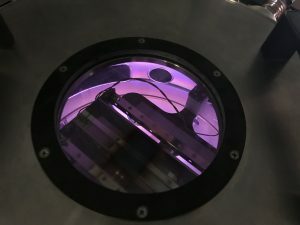 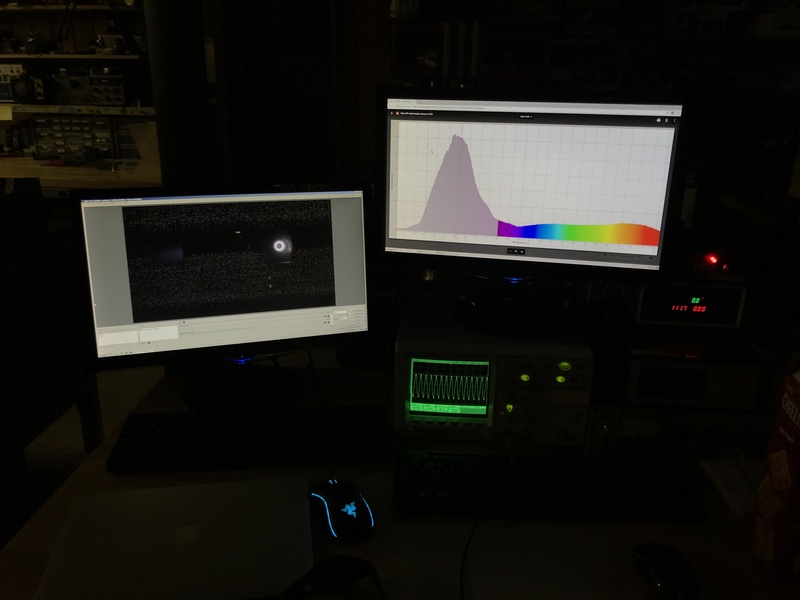 The UV-VIS spectrometer is used to monitor the emission spectra of O2 plasma. 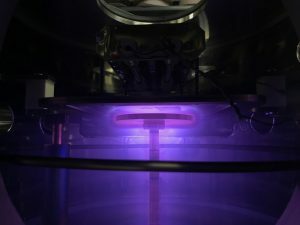 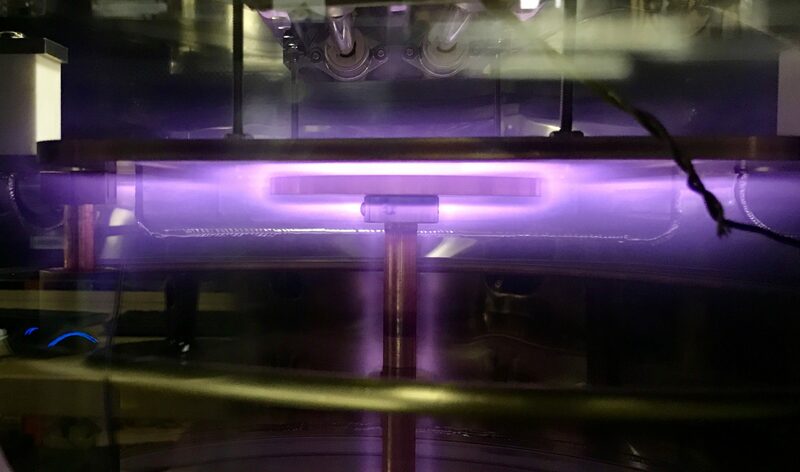 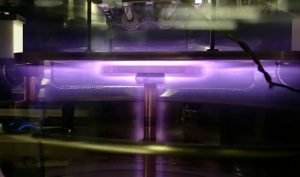 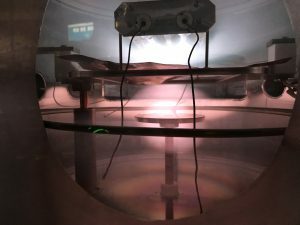 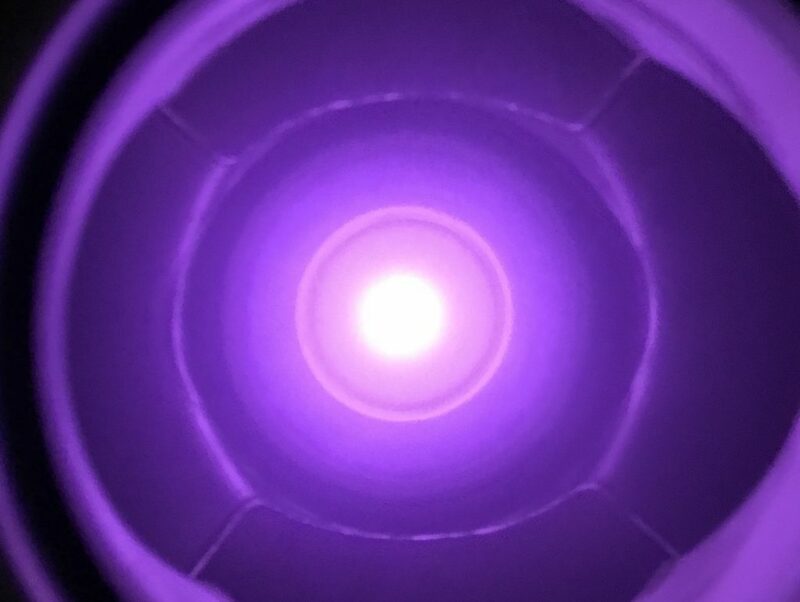 O2 is flowed into the chamber via a Mass Flow Controller (MFC) until the pressure is 75-100mTorr and the substrate is plasma cleaned for 5 minutes with 100W RF prior to depositions. As current pass through the boats, they heat up to 1000 – 1800C and subsequently heat up much of the surrounding chamber and mounting parts. 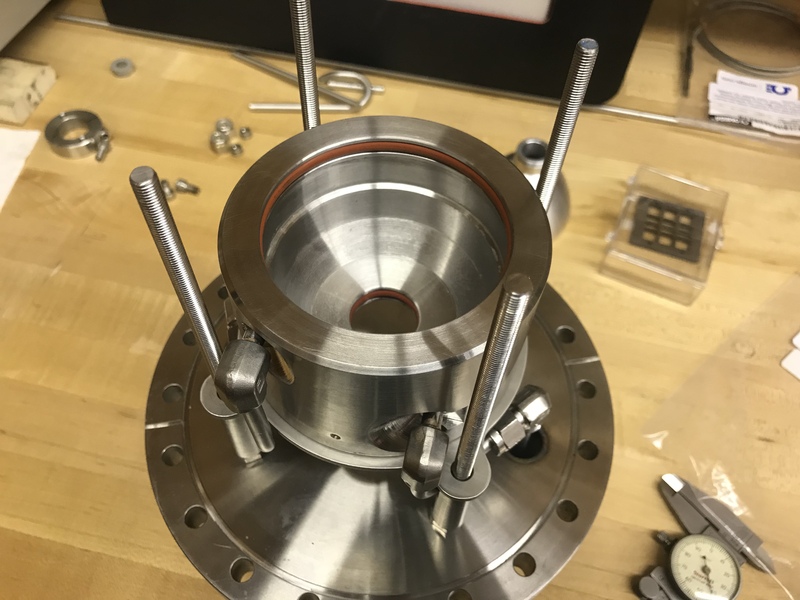 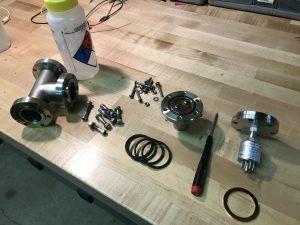 This starts serious outgassing in the chamber and without prior cleaning and bake out quickly raises the pressure to non-workable pressures and the deposition rate slows. 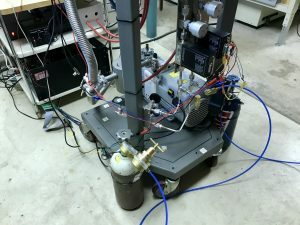 I added a second turbo pump to raise the pumping speed/gas throughput (previously 110L/s and now an additional 50L/s) and to tolerate higher outgassing. 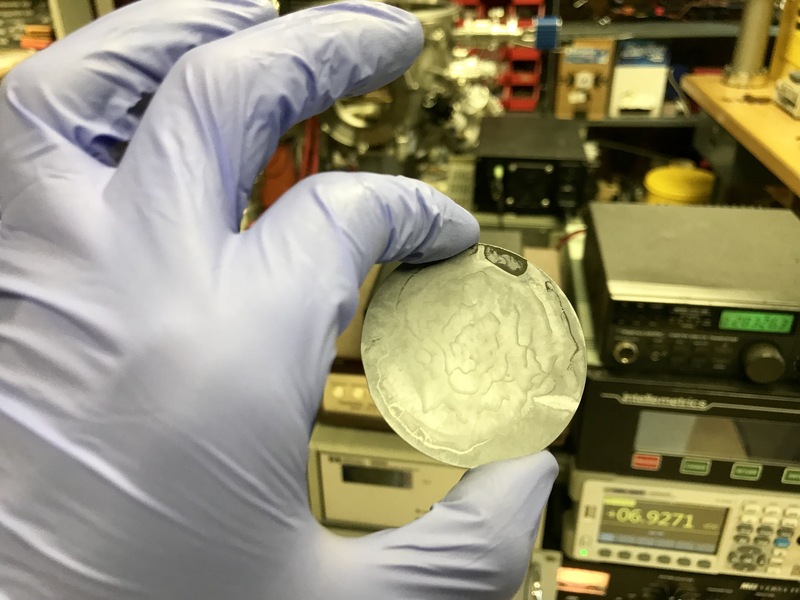 It was also noted that the evaporation of Al with lots of H2O vapor in the chamber (no baking) leads to a reduction of chamber pressure (presumably the formation of Al2O3 with H2O) and the production of H2 as seen on an RGA. 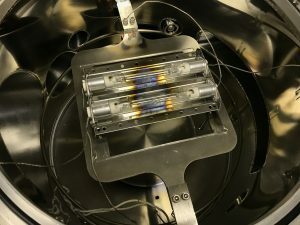 A small, modular, and versatile chamber was constructed for plasma and other research experiments. 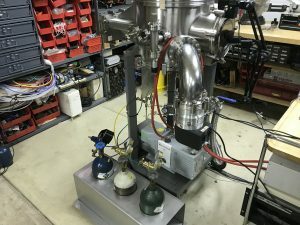 The main vacuum manifold can be configured with multiple feedthroughs in either standalone vacuum mode or connected to a large chamber. 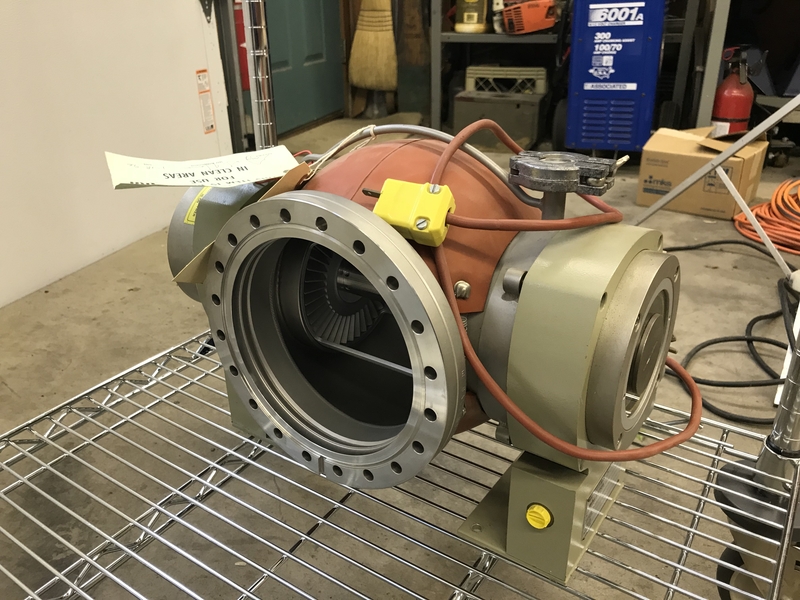 The front is a 6″ CF viewport that can be swapped for a gas feedthrough assembly. 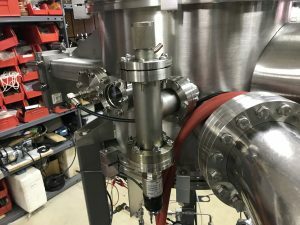 The chamber is being used right now to study simulate vacuum conductance and pressure gradients across larger chamber systems such as an ion implanter with a turbo pump on one end and an ion source and MFC gas flow far away from the pump. 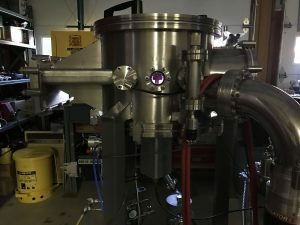 The gas flow creates a higher pressure in the ion source chamber and, in theory, allows for low energy beam transport and acceleration into a much lower pressure substrate/target chamber (in the case of an ion implanter). 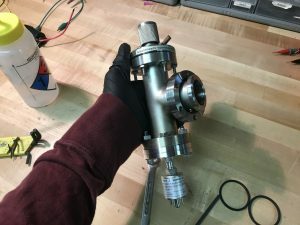 A quick attempt making a titanium sublimation pump. 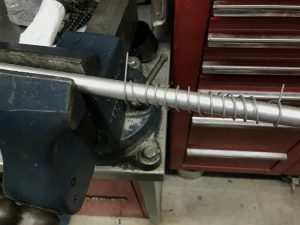 Ti welding rod was bent into a coil around aluminum round stock and placed across 30-50 amps in high vacuum yielding successful results. 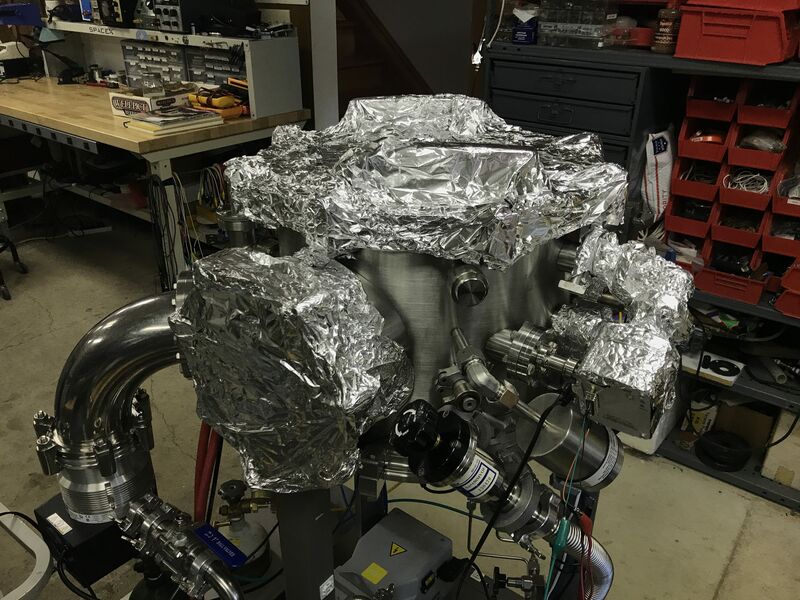 Chamber was roughed down to 20mTorr then pumped with turbo to 1e-5 and briefly baked out. 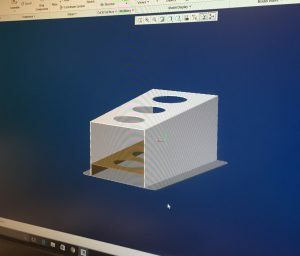 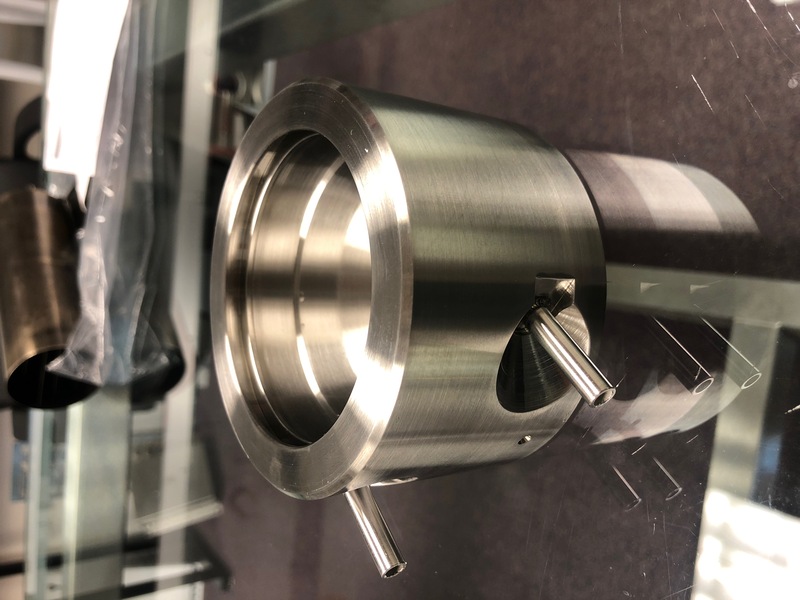 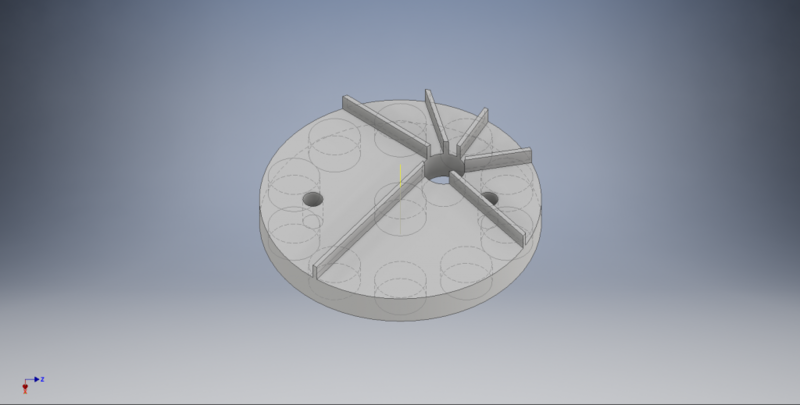 More testing will be done and results will be posted along with an updated design with shielding to make it into an actual pump rather than depositing all over the chamber walls. 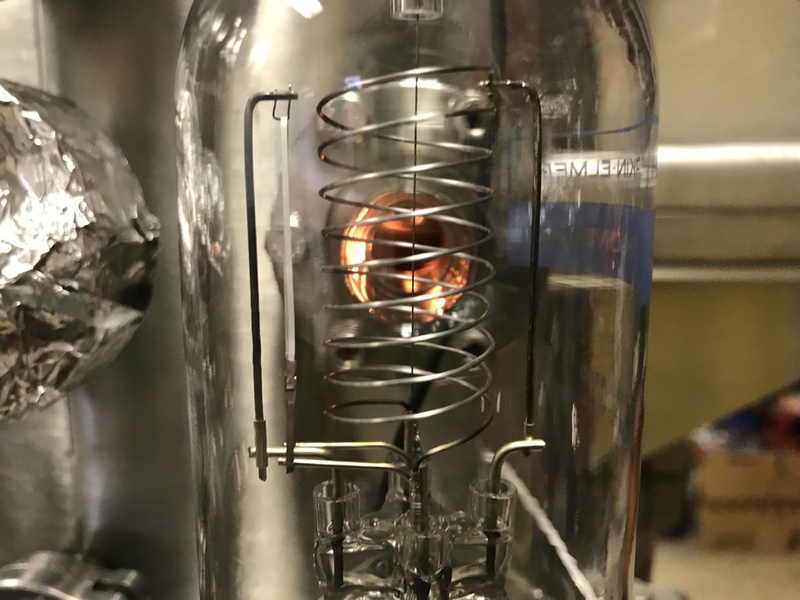 During testing I experienced a strange pumping curve a few times as shown in the last picture where the filament while heated at 50 amps seemed to out gas twice before reaching sublimation. 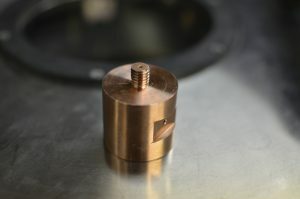 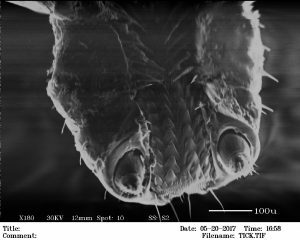 The basic idea of a TSP or getter pump is that the filament is heated past 900 degrees c with a high current across it. 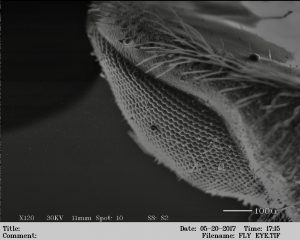 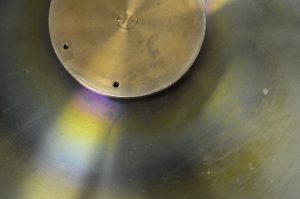 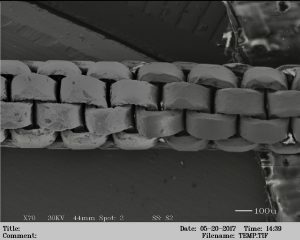 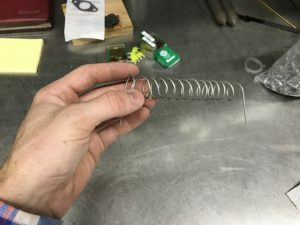 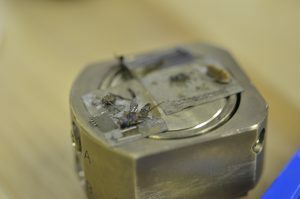 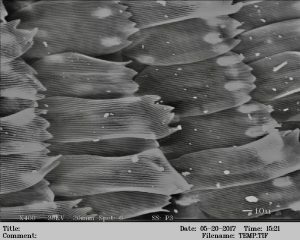 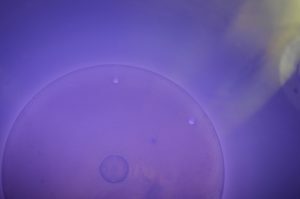 The filament first out gases and raises the chamber pressure, but then reaches sublimation pressure where it begins to form a thin volatile coating of Ti on the chamber walls. 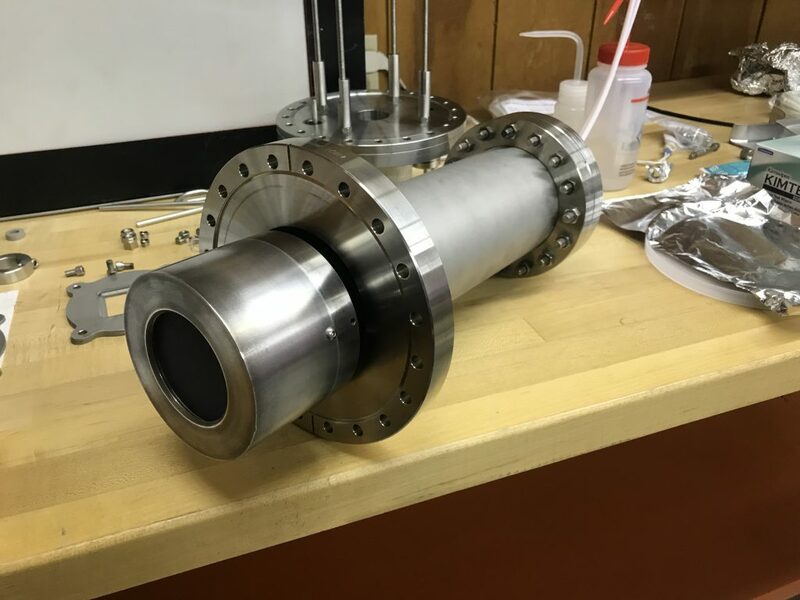 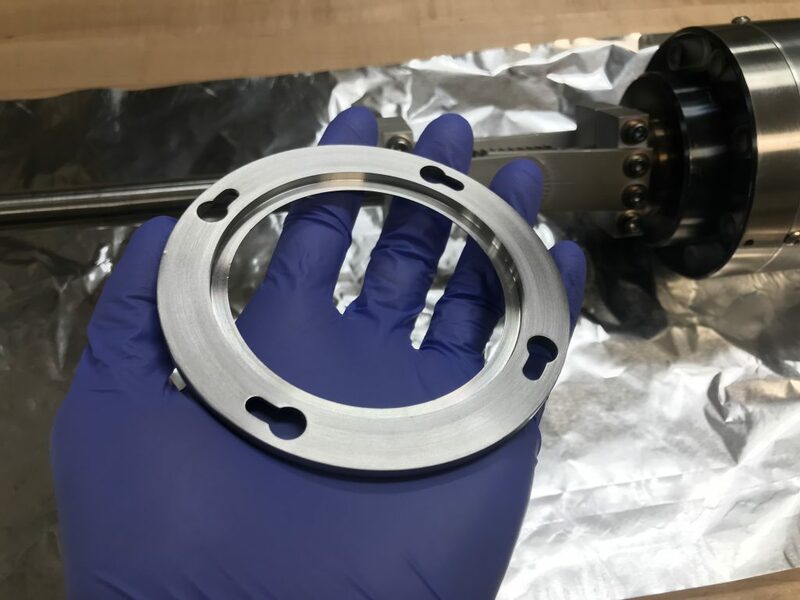 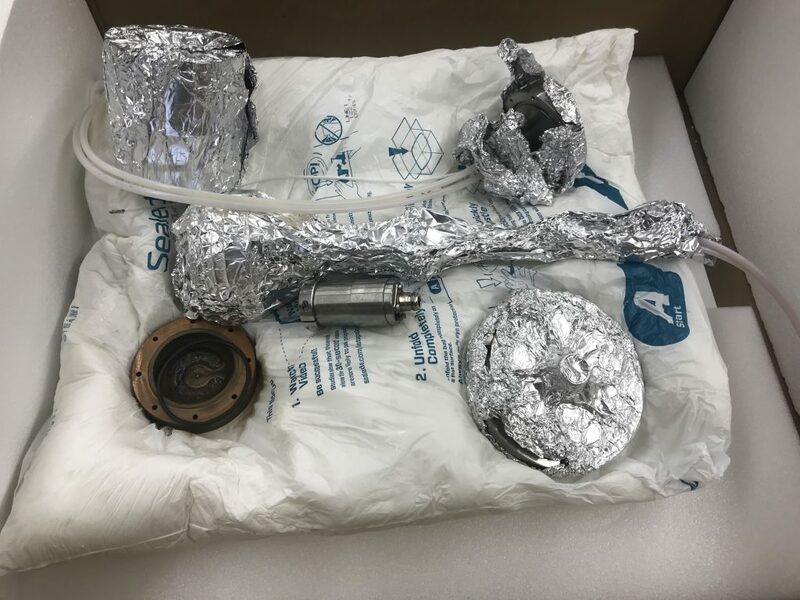 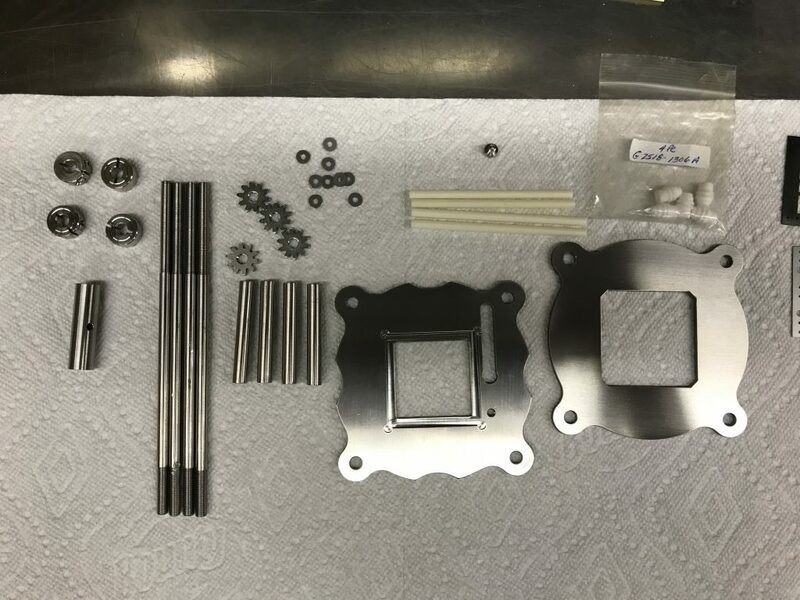 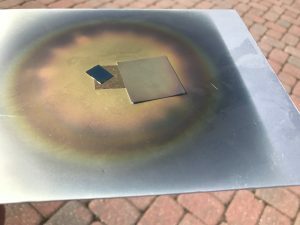 Titanium, in this heated state, will readily combine with gaseous specious in the chamber to form a more stable coating and the gas molecules in the chamber basically get incorporated into a thin film on the chamber walls and trapped. 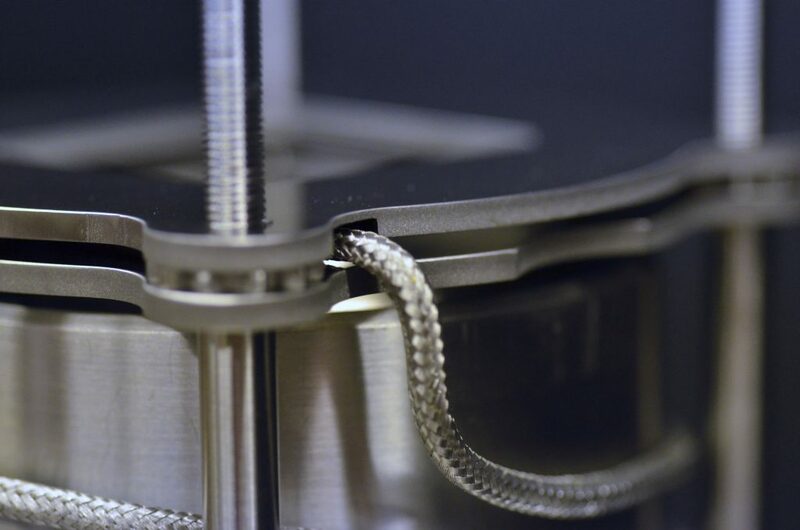 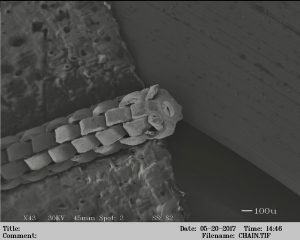 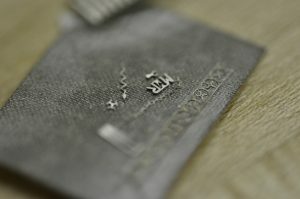 The filament current is cycled for highest effectiveness. 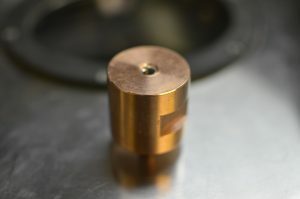 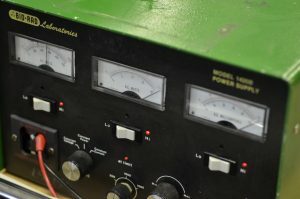 A rewound MOT is used for high current supply. 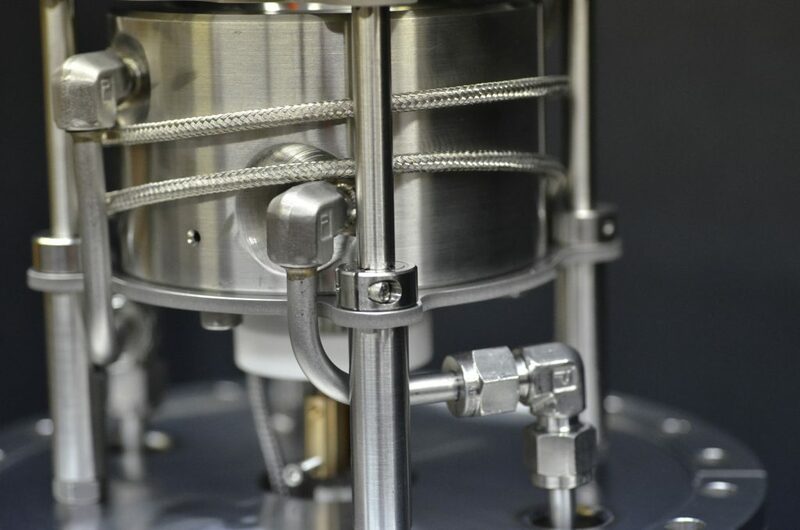 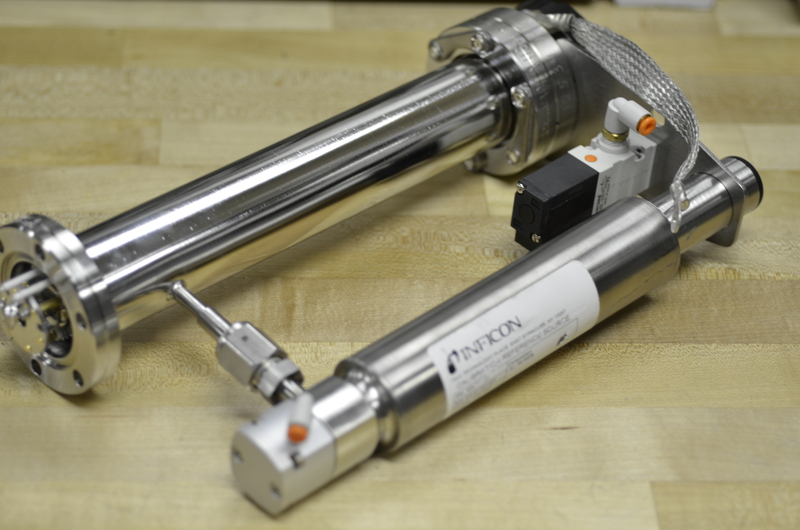 Two internal radiant infrared heat lamps and external resistive heating elements are used to bakeout the vacuum system for 24 hours allowing for ion pump operation. 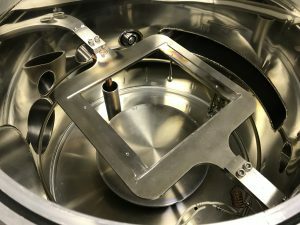 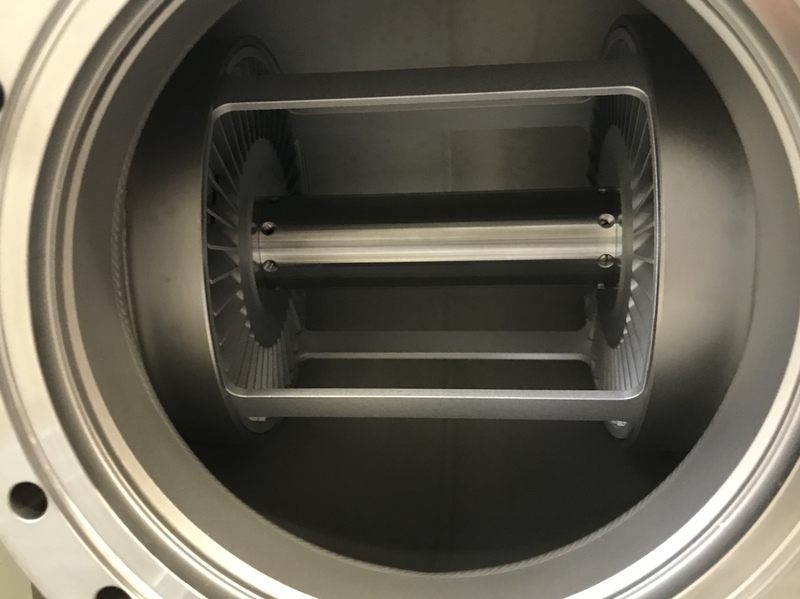 Normally when the chamber is full of unwanted moisture and impurities ionizing gas in the chamber will lead to a sharp increase in pressure due to plasma cleaning of the chamber walls and subsequent release of gas molecules.